K – Art for Art's Sake! 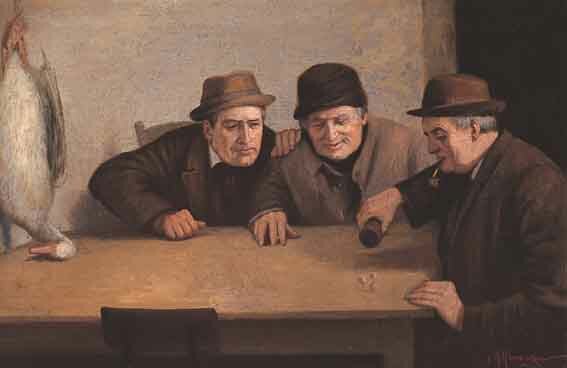 Left to right: “On the banks of the Laita, Finistere” dated 1885, oil on canvas (27″ x 18.5″), sold at Whyte’s – 10/10/2000 for €5,714; and “The Dice Throwers” oil on canvas (20″ x 30″), sold at Whyte’s 13/6/2001 for €5,840 including buyer’s premium. Rasher (Mark Kavanagh) was born in 1977 in the seaside town of Bray, County Wicklow. He attended St. Killian’s School and St. Thomas’ VEC. 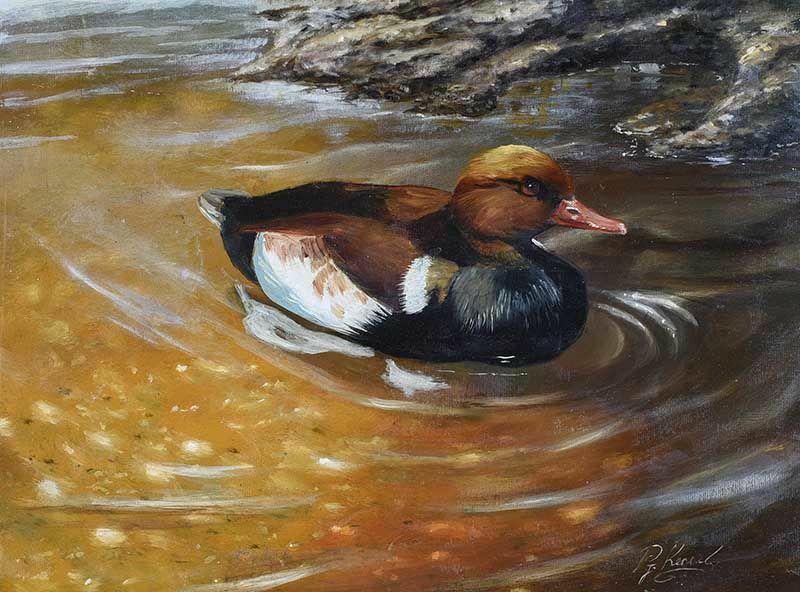 Rasher is a self-taught artist working in his preferred medium of oil paint. After attracting interest with several self-mounted shows, he held successful solo shows in Dublin and Los Angeles, gaining international publicity and appearances on the Late Late Show. 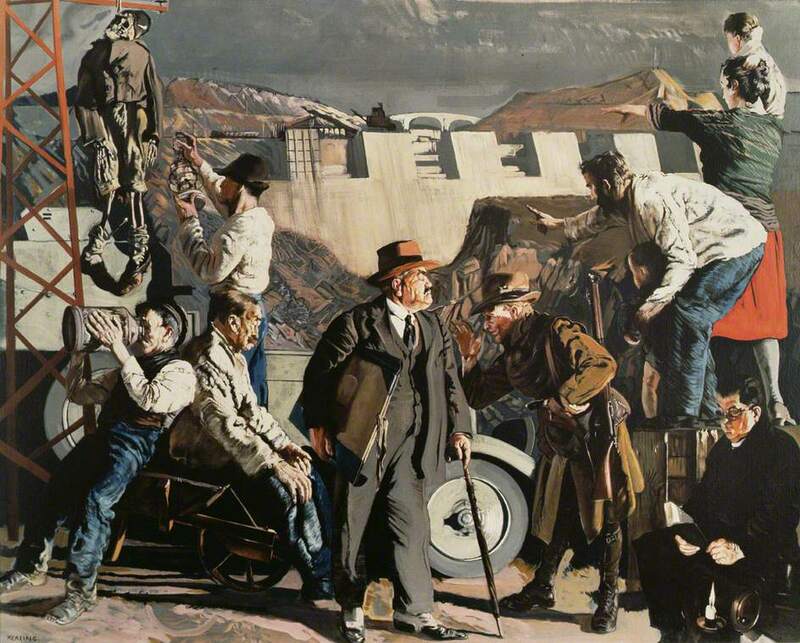 He has firmly established himself as one of the most interesting painters of his generation. 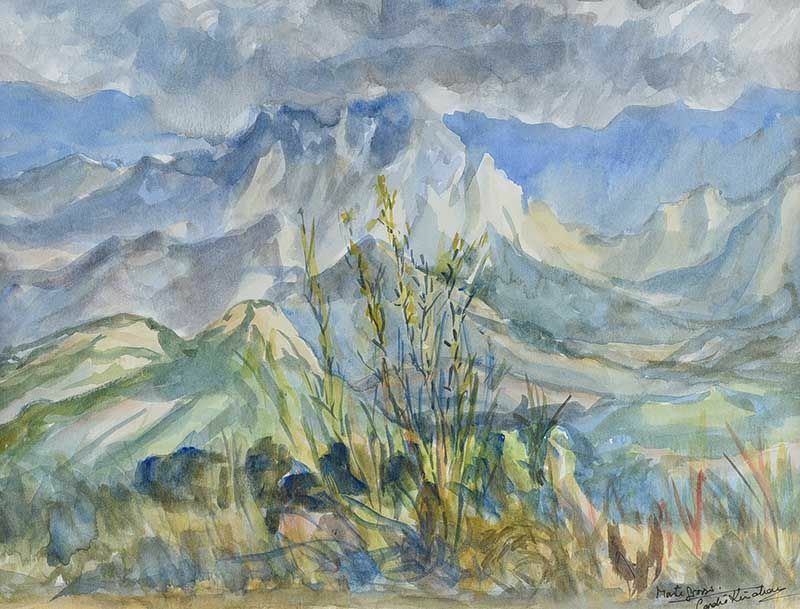 He continues to strive for more challenging ideas and techniques in painting. “Groundhog Day” and “Comfortably Numb“. 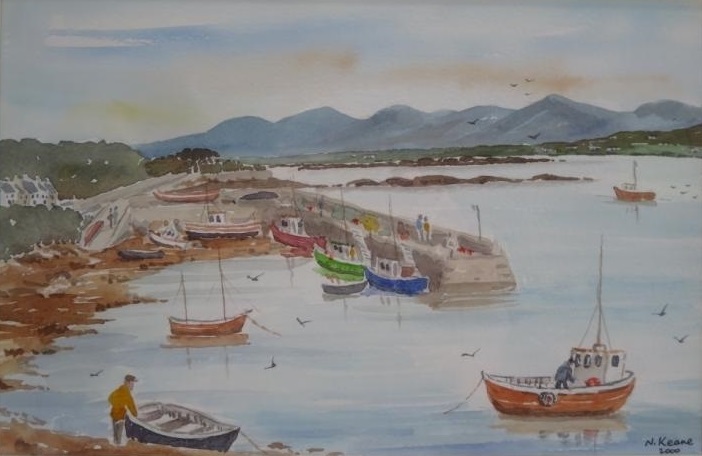 Watercolour artist from Roundstone in County Galway. 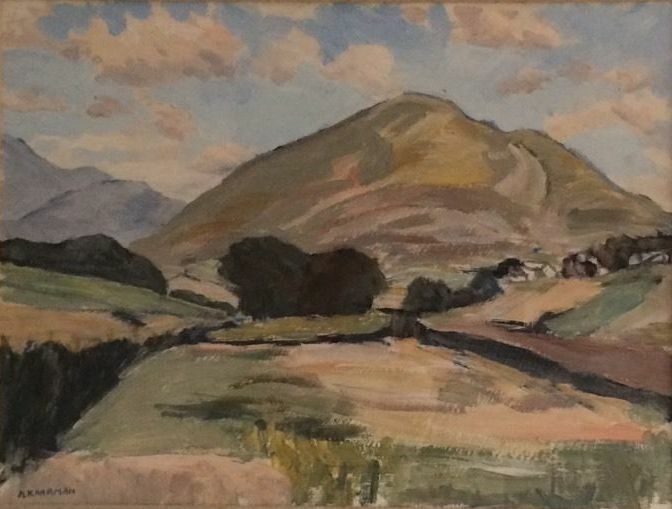 Untitled West of Ireland scene, dated 2000, watercolour (7.5″ x 10″) – unsold at Litchfield Country Auctions, Connecticut, USA – 16/9/2017. 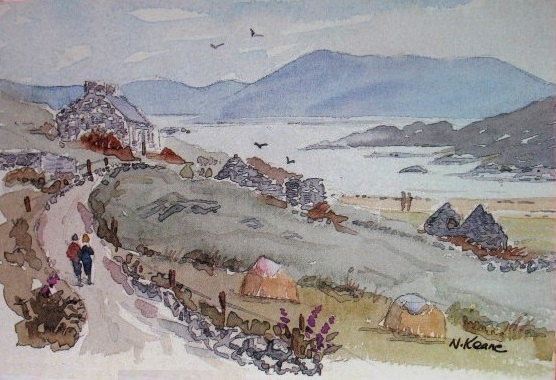 Left to right: More of the artist’s work may be found in the above book published by the Travel Memories Press., Indianapolis, 2001; and a postcard view of Inishbofin Island published in 1991. 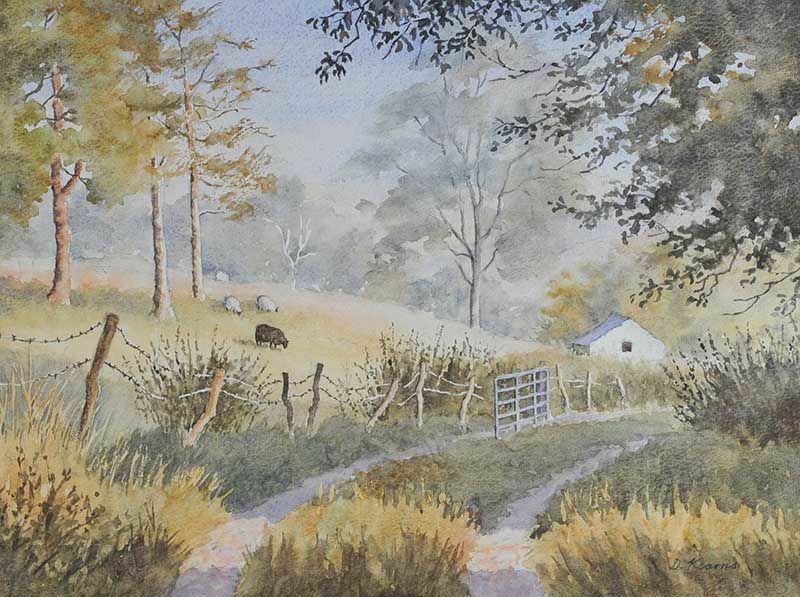 “Black Sheep, Slieve Croob” watercolour drawing (11″ x 15″). 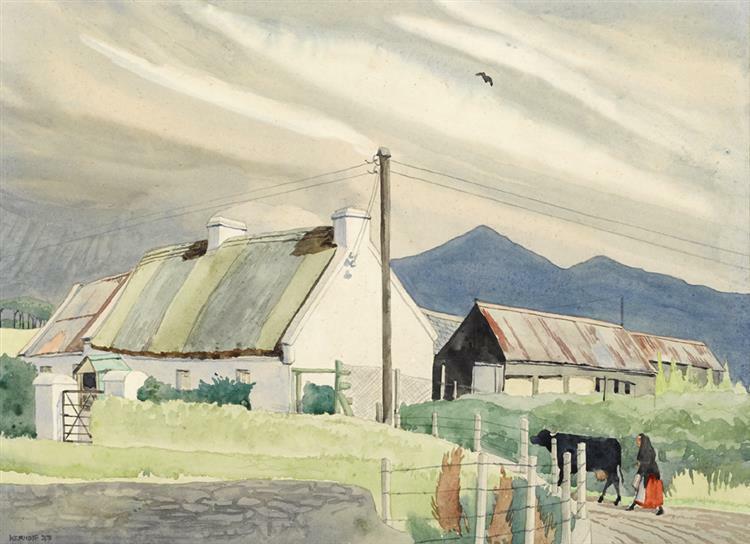 “Across to the Mournes” watercolour drawing (14″ x 21″), sold at Ross’s – 3/12/2015 for £50. 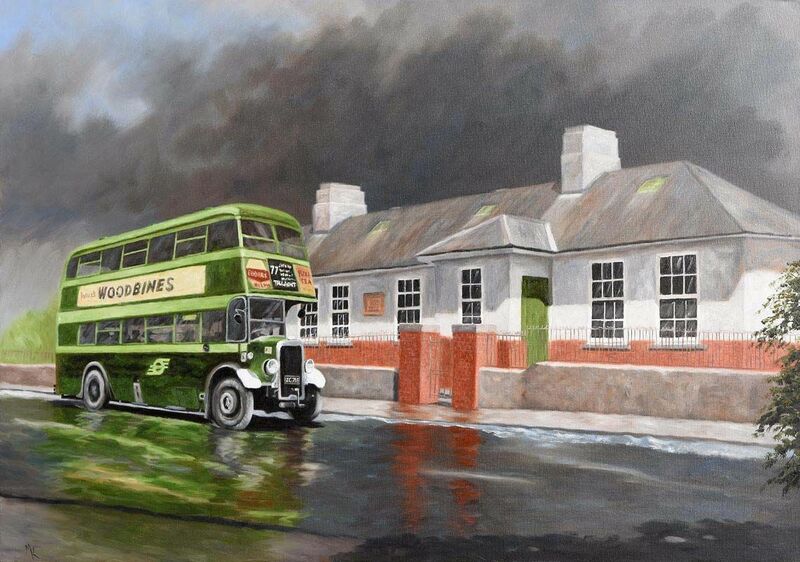 “Burning the Kelp” oil on board, dated 1974 (22″ x 30″), sold at Adam’s – 7/12/2016 for €20,000. “The Aran Island Turf Boat” oil on canvas (25″ x 30″), sold at Whyte’s – 26/2/2018 for €38,000. 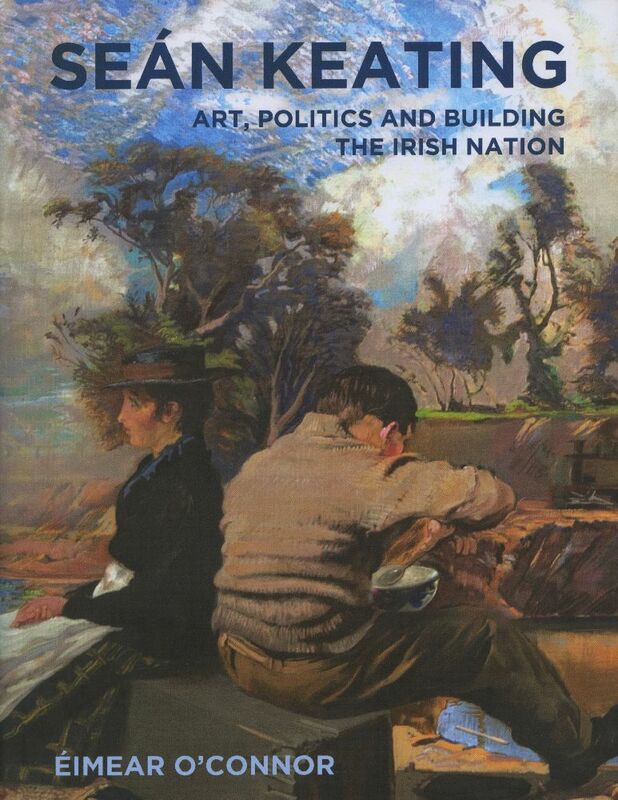 Published by the Irish Academic Press (2013). 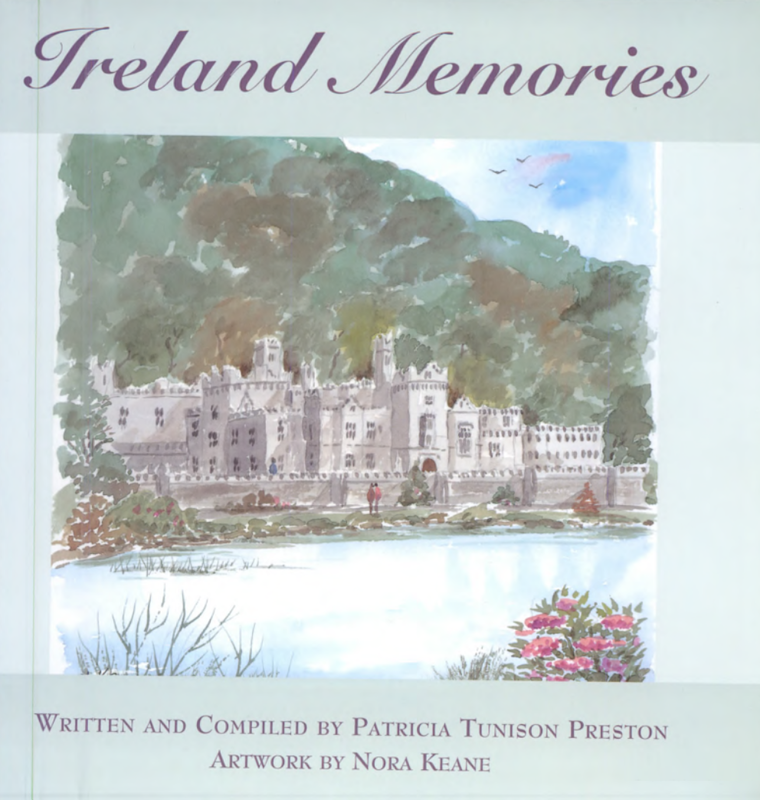 Richly illustrated in colour with over 200 paintings, sketches, and photographs, many previously unpublished. 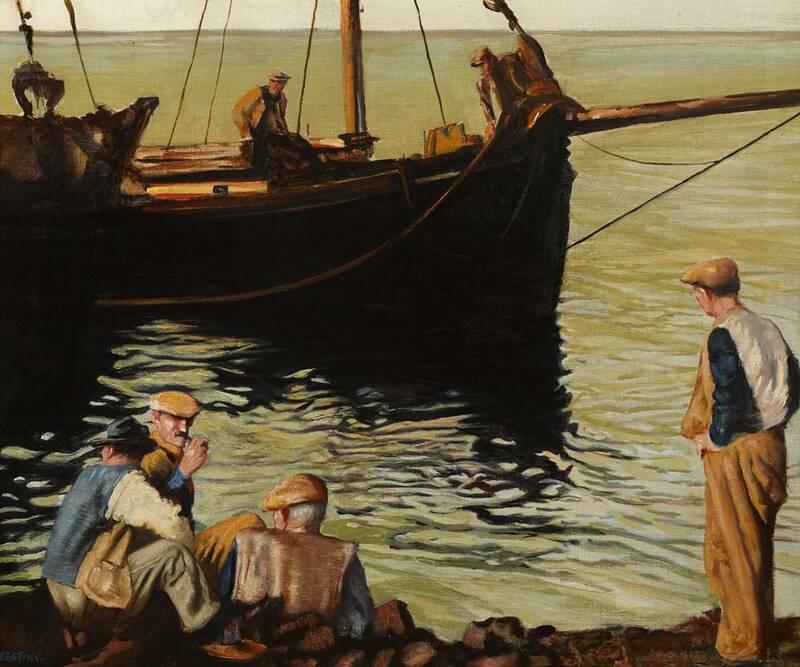 “Ballycastle Fishermen” oil on board (12″ x 48″), unsold at Ross’s – 5/9/2018. “Bull on Grey” oil on board (15″ x 15″), unsold at Ross’s 7/12/2016. Left to right: “Portrait of Owen Binchy – Chairman 1962/65” oil on canvas (23″ x 20″), sold at Morgan O’Driscoll’s – 6/11/2017 for €50.00; and “R.A. 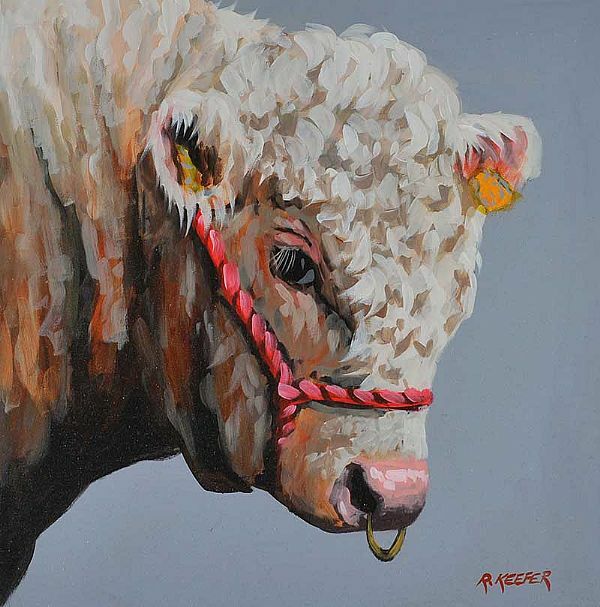 Anderson” oil on canvas (23″ x 19″), sold at Morgan O’Driscoll’s – 29/1/2018 for €160.00. 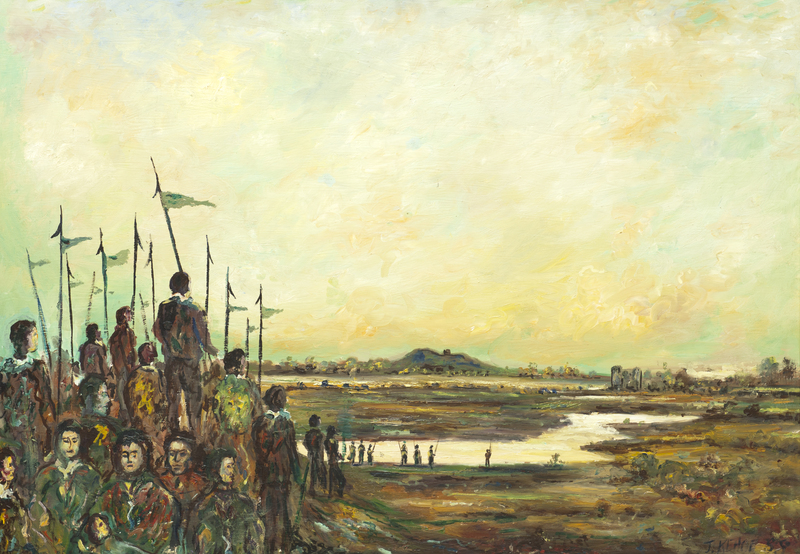 “Pikemen of Vinegar Hill” oil on board (28.5″ x 39.5″) – Wexford County Council Art Collection. 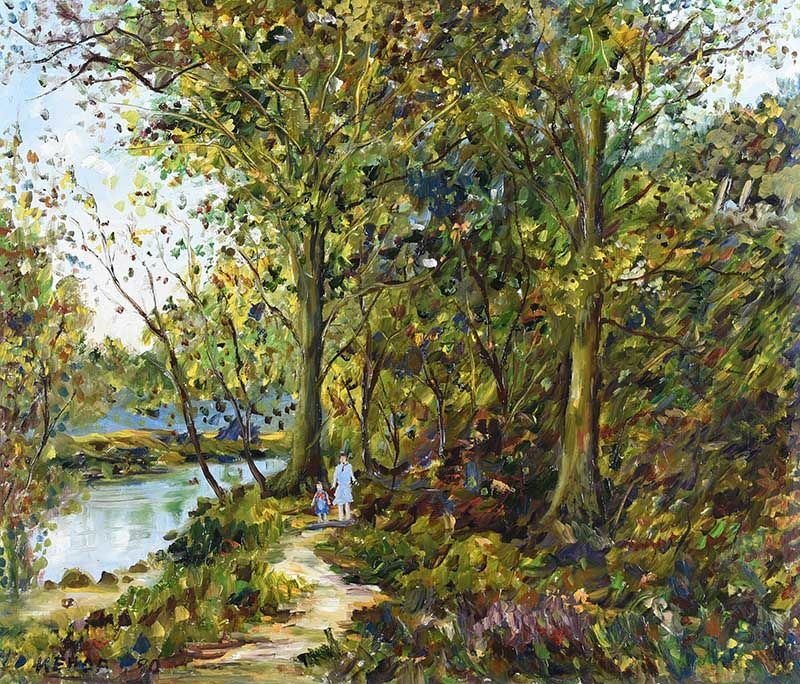 “Borodale, Summer Walk” oil on board (24″ x 28″), unsold at Ross’s – 13/2/2019. 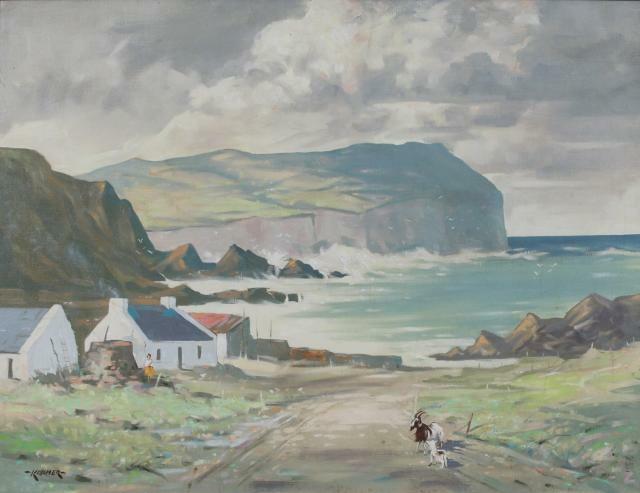 “Clogher Head, Co.Louth” dated 1977, oil on canvas (26″ x 34″), sold at Dolan’s (Limerick Auction) – 2/3/2014 for €225.00. 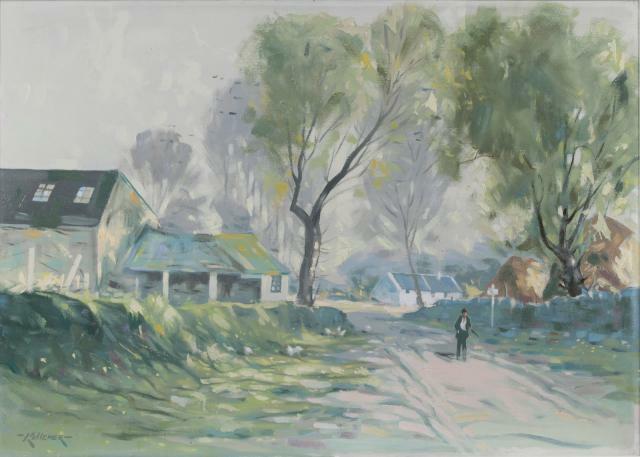 “Early Morning, Gillogue, Limerick” oil on canvas (21″ x 29.5″), sold at Dolan’s (Limerick Auction) – 2/3/2014 for €200.00. 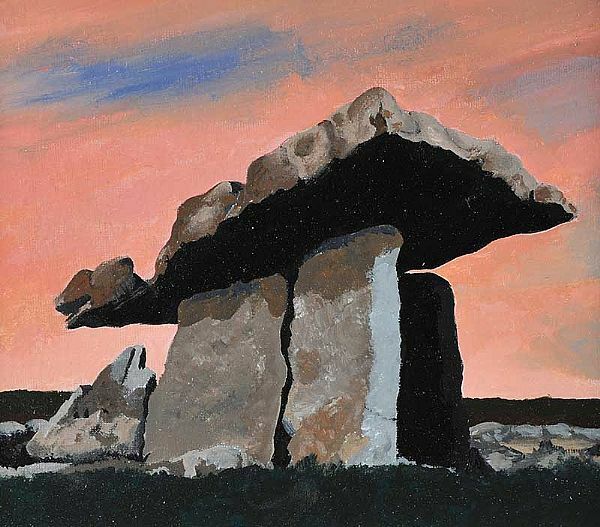 “Poulnabrone Dolmen, Clare” oil on board (5″ x 7″), unsold at Ross’s 7/12/2016. 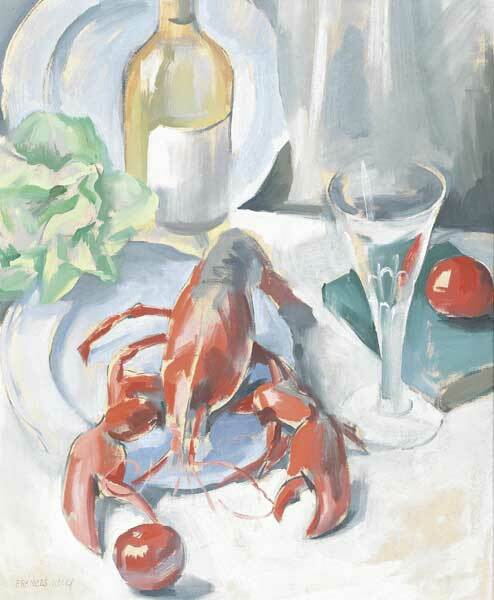 “Still Life with Lobster” oil on canvas (24″ x 20″), sold at Whyte’s – 18/5/2009 for €4,400. 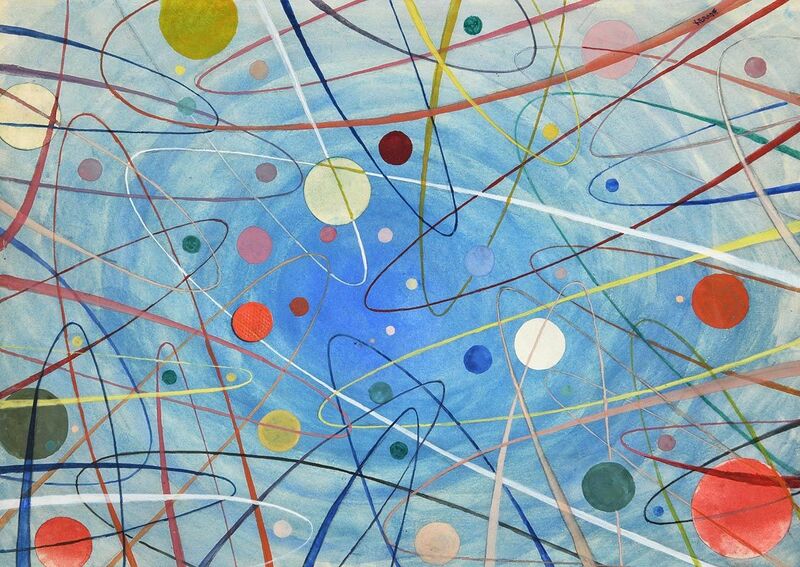 “Saw Ohn Nyun” XXI, oil on canvas (42″ x 29”), sold at James Adams – 28/3/2007 for €58,000. 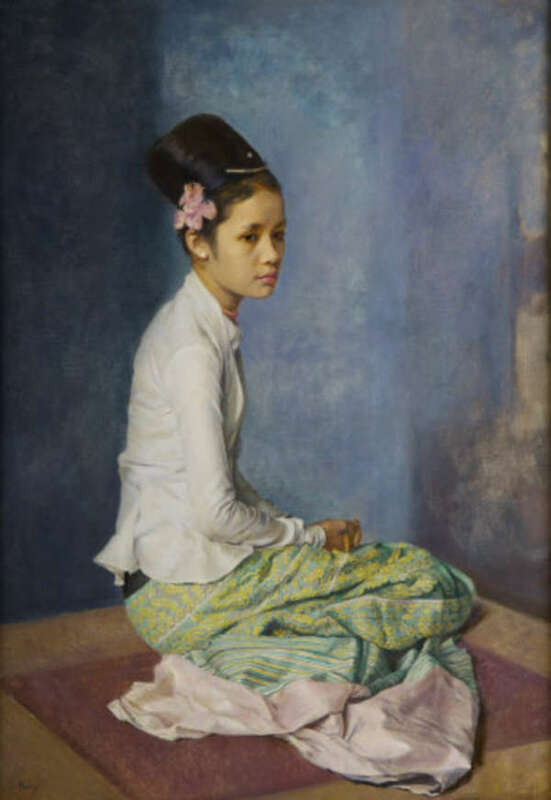 Portrait of a Seated Lady, oil on canvas (41″ x 33″). 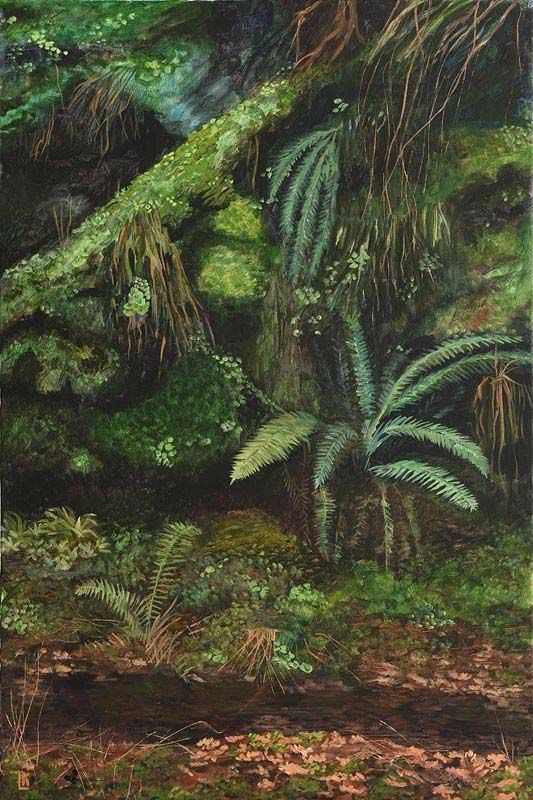 “Ferns – West Cork Railway Cutting” oil on canvas (35″ x 23″), sold at Morgan O’Driscoll’s – 6/3/2017 for €320.00. 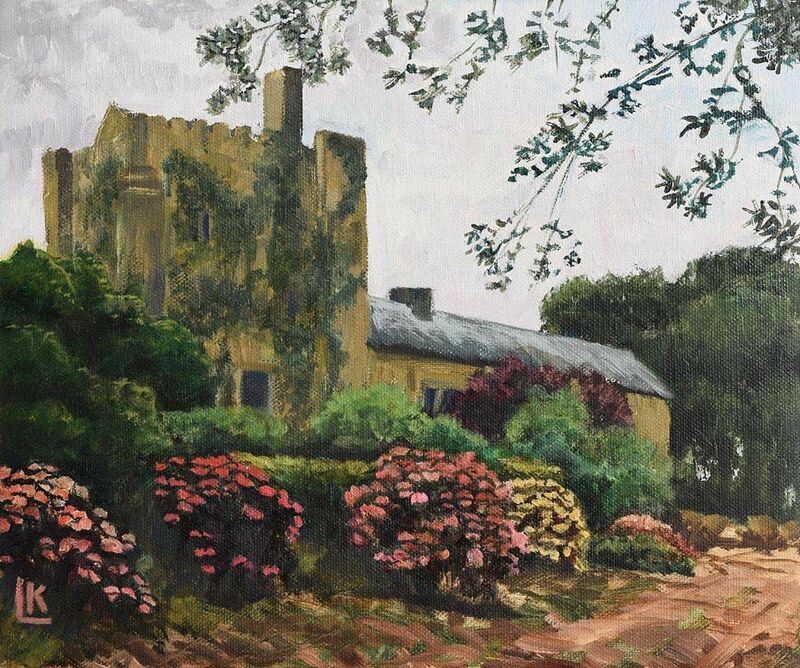 “Tower House near Lismore, Co.Waterford” oil on canvas (10″ x 12″), sold at Morgan O’Driscoll’s – 14/8/2017 for €120.00. 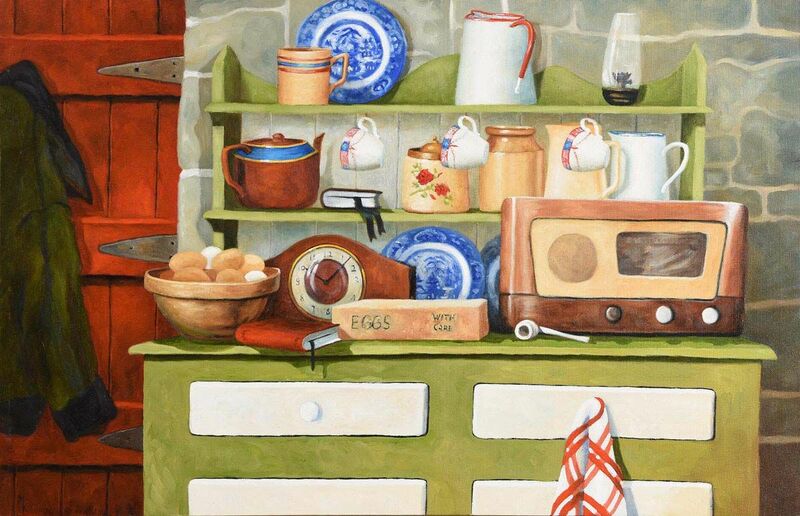 Completely self-taught, Kelly paints in a conventional pre-impressionist style in both oils and watercolour. 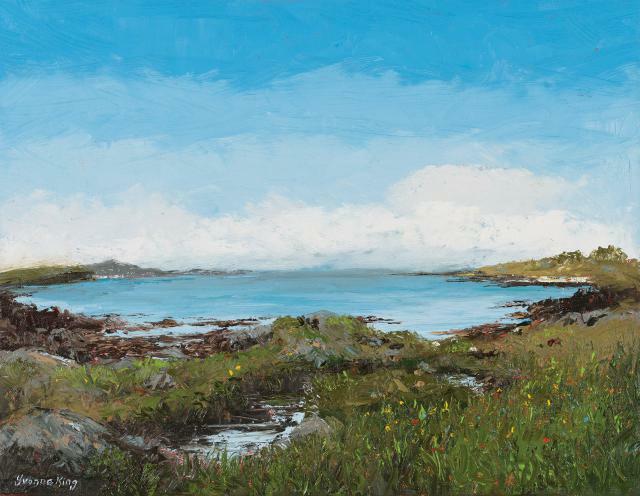 “Skerries” oil on card (10″ x 12″). 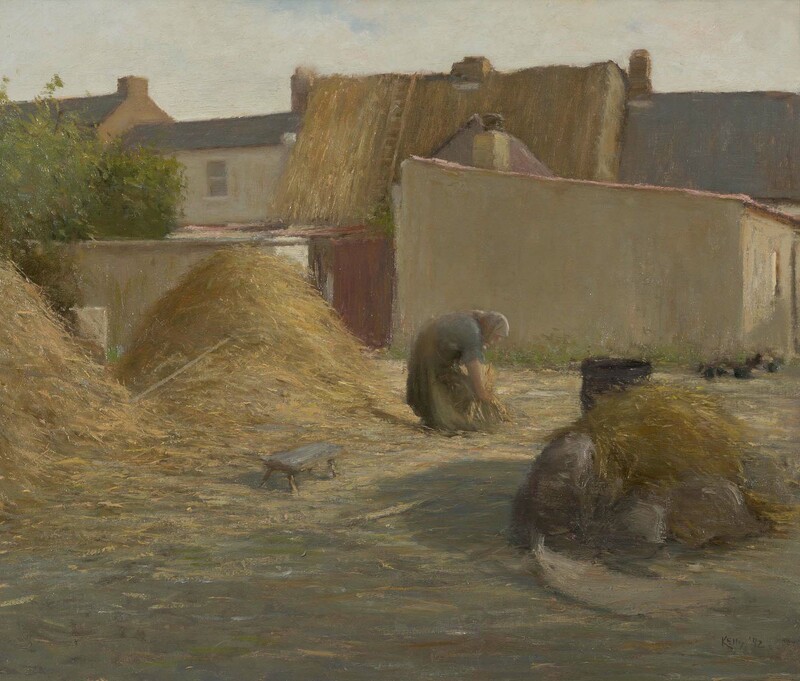 “Preparing the thatch – Rush” oil on canvas (24″ x 28″), unsold at de Vere’s – 17/4/2018. 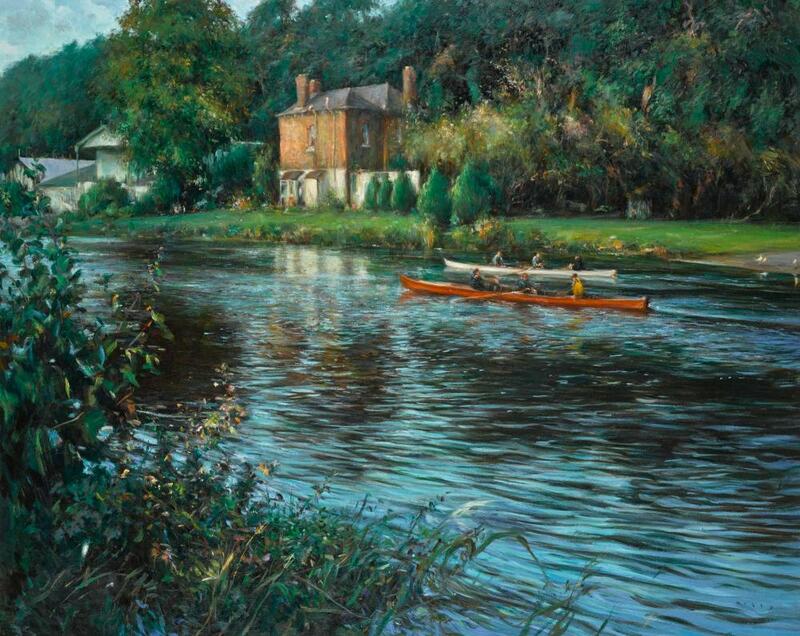 “The Liffey Rowers, Islandbridge, Dublin” oil on canvas (40″ x 50″), unsold at Sotheby’s (London) – 21/11/2018. 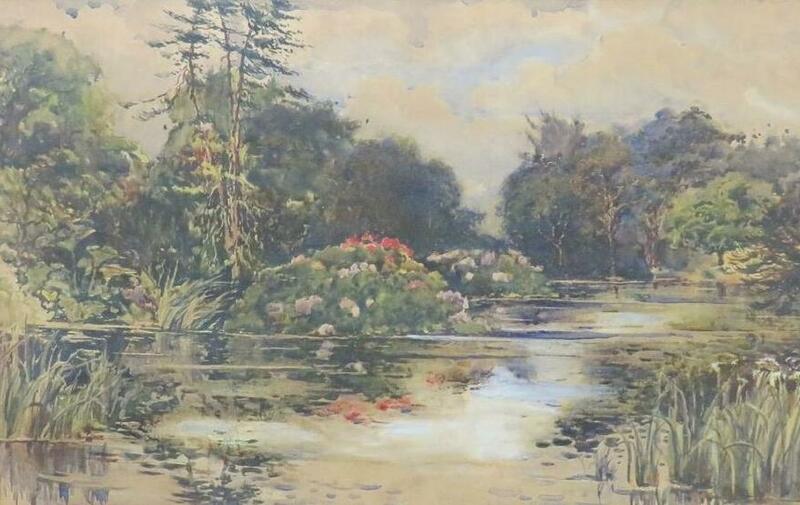 “The Lake, Old Dromore, Mallow, Co.Cork” watercolour (12.5″ x 19″) – may have been exhibited at the RHA in 1899 – sold on eBay 14/4/2019 for £34.00. 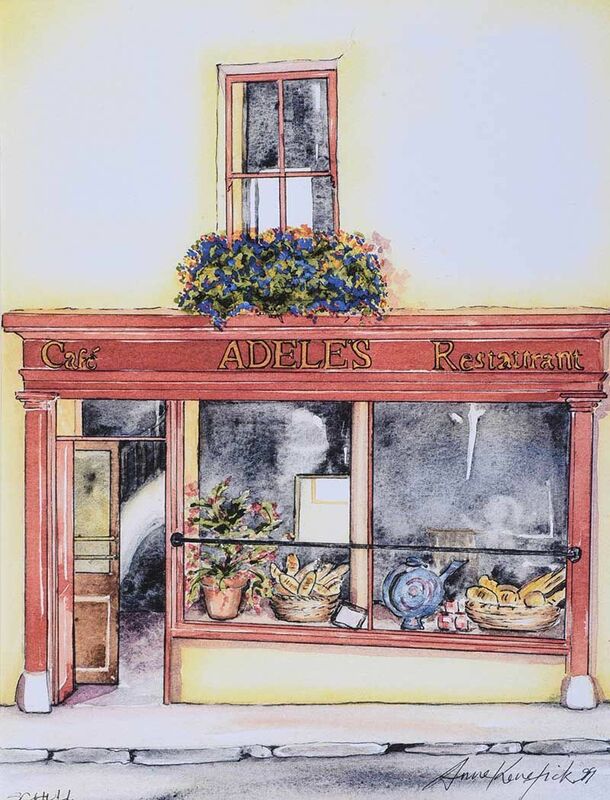 “Adele’s Restaurant” watercolour drawing (11″ x 8.5″), sold at Ross’s – 21/3/2018 for £30.00. 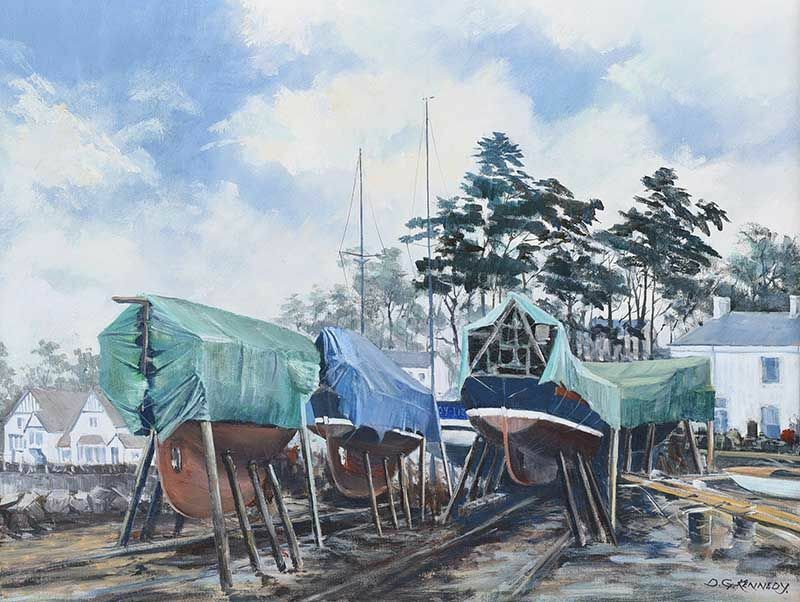 “Cultra Yachts” oil on canvas (18″ x 24″), unsold at Ross’s – 13/2/2019. 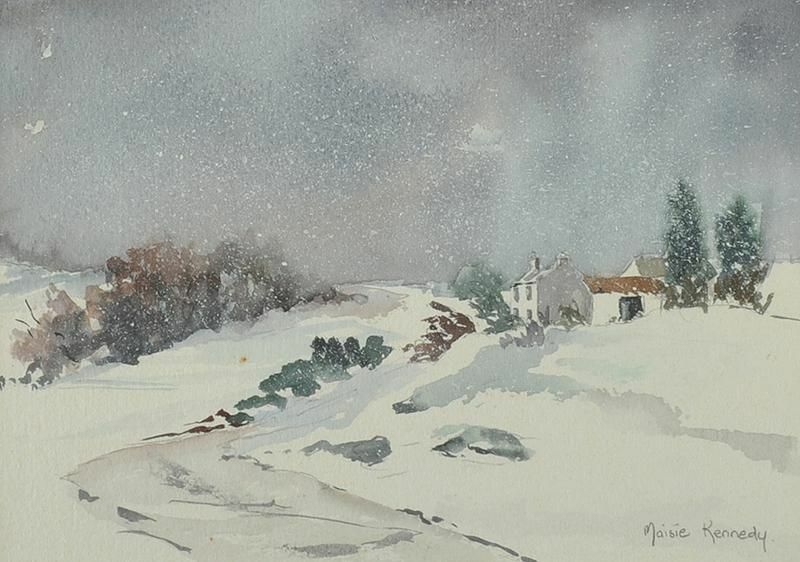 “Winter Landscape” watercolour drawing (7″ x 9″) Unsold at Ross’s – 30/4/2014. “Waiting for Tea Time” oil on canvas (20″ x 30″), unsold at Morgan O’Driscoll’s – 22/5/2017. “St.Basil’s Boys & Girls’ School” oil on canvas (23″ x 33″), unsold at Morgan O’Driscoll’s – 14/8/2017. 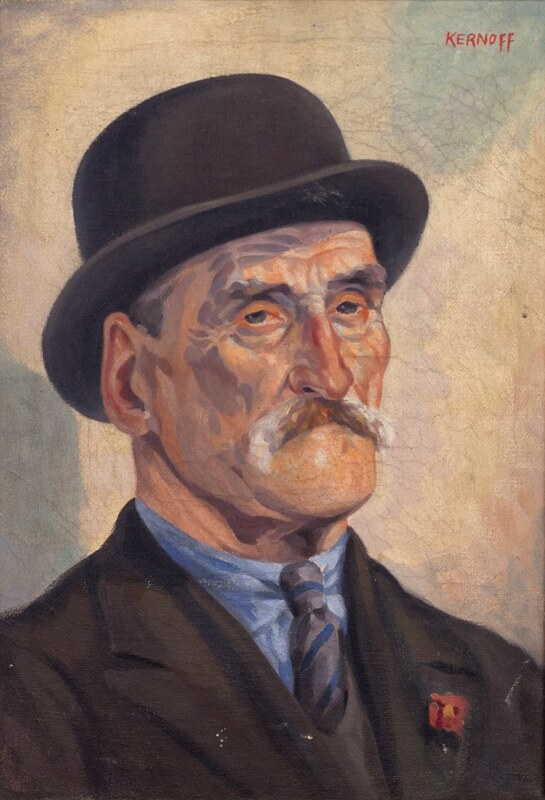 Dublin artist active in the 1960’s. 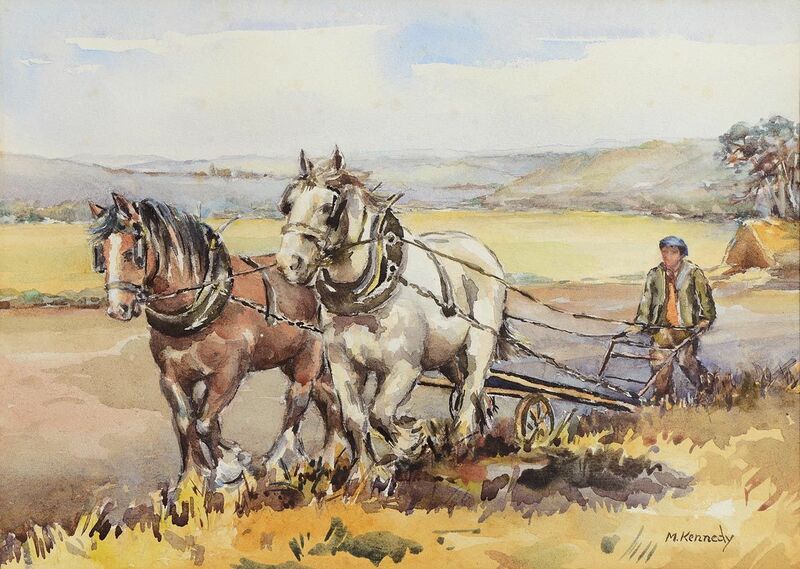 “Ploughing in Co. Dublin” 1961, watercolour (10″ x 14″), sold at Morgan O’Driscoll’s – 25/9/2017 for €100.00. 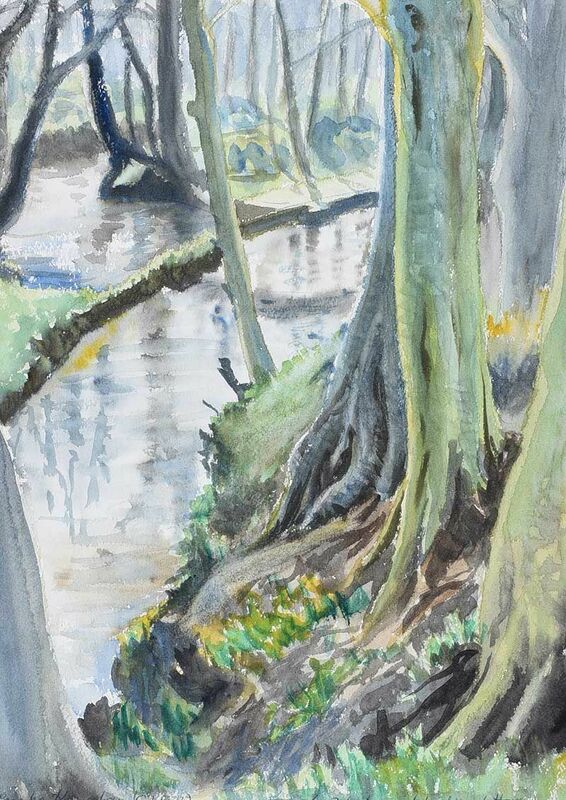 “Bluebell Wood” watercolour drawing (9.5″ x 13″), sold at Ross’s – 1/8/2012 for £60.00. 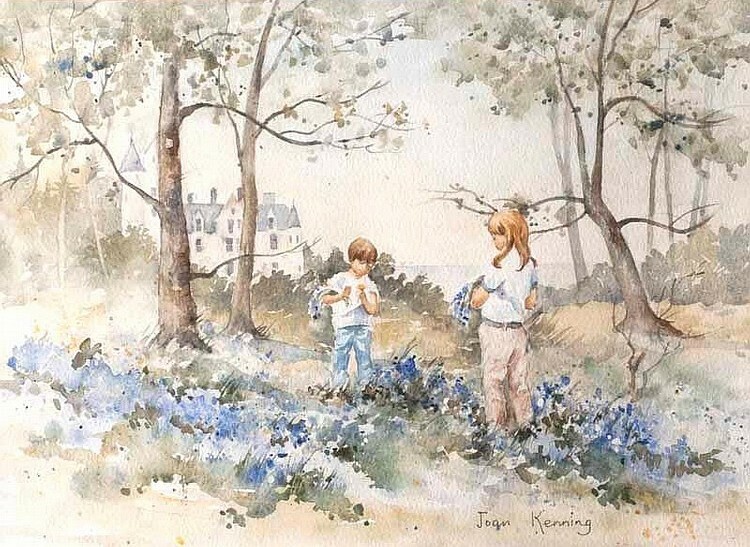 Left to right: “Follow the Leader” watercolour drawing (11″ x 13″), sold at Ross’s – 10/9/2014 for £30.00; and “Cottage with the Blue Door” watercolour drawing (9″ x 11″), sold at Ross’s – 11/10/2017 for £60.00. “Landscape with cottages” oil on board (6″ x 8″), sold at Whyte’s – 23/10/2017 for €240.00. “Swimming in a Rock Pool” oil on board (12″ x 15.5″), unsold at Ross’s – 16/1/2019. 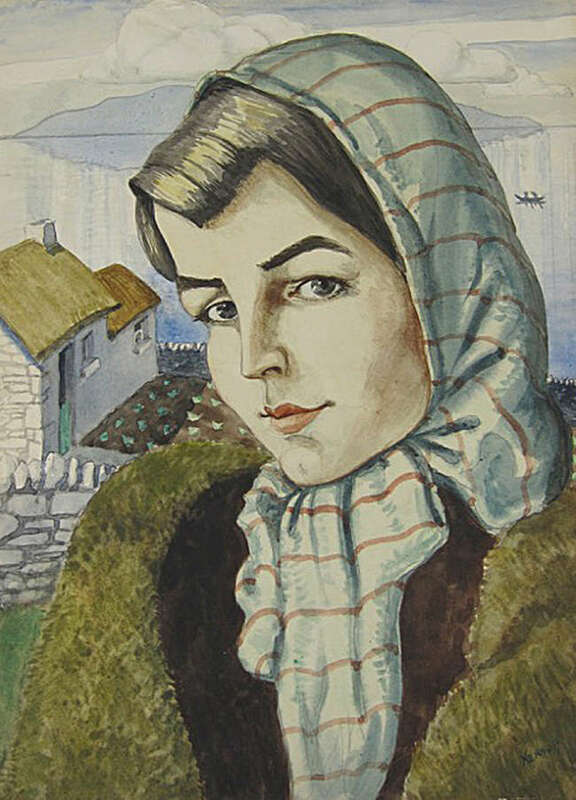 A graduate of the National College of Art, Dublin, the artist now lives on the Dingle Peninsula, Co. Kerry. “Westport Mall, Co.Mayo” pastel on card (12″ x 16″), sold at Morgan O’Driscoll’s – 24/10/2016 for €4,000.00. 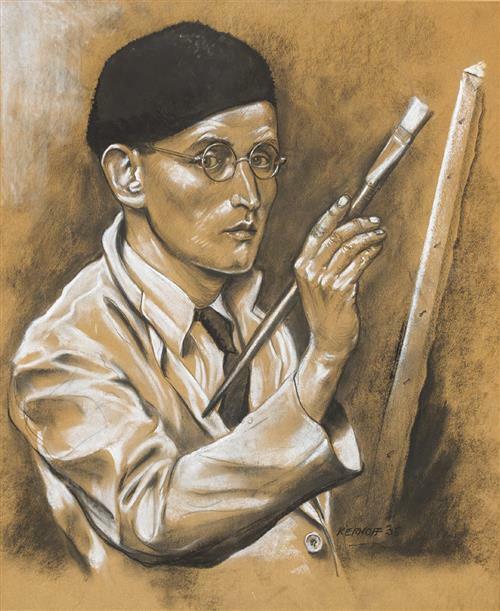 Left to right: Self portrait, 1936. Chalk on tinted paper (18″ x 15″), sold at Whyte’s Online Sale – 24/10/2016 for €2,100.00; “The Trade Unionist” oil on canvas (17″ x 12″), sold at Mealy’s – 8/3/2017 for €700.00; and “A Galway Girl” watercolour (15″ x 11″), sold at Adam’s – 31/5/2017 for €2,500. 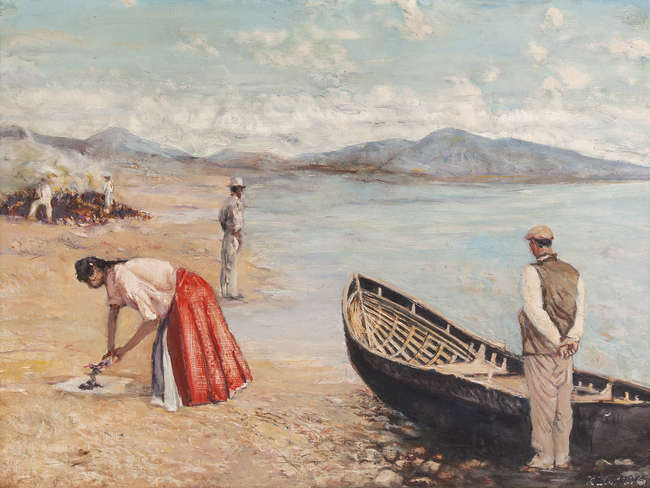 Left to right: “Woman walking a cow in for milking” dated 1943, watercolour (10″ x 14″), sold at Whyte’s – 2/10/2017 for €2,700; and “Howth Harbour, Evening” oil on board (12″ x 16″). 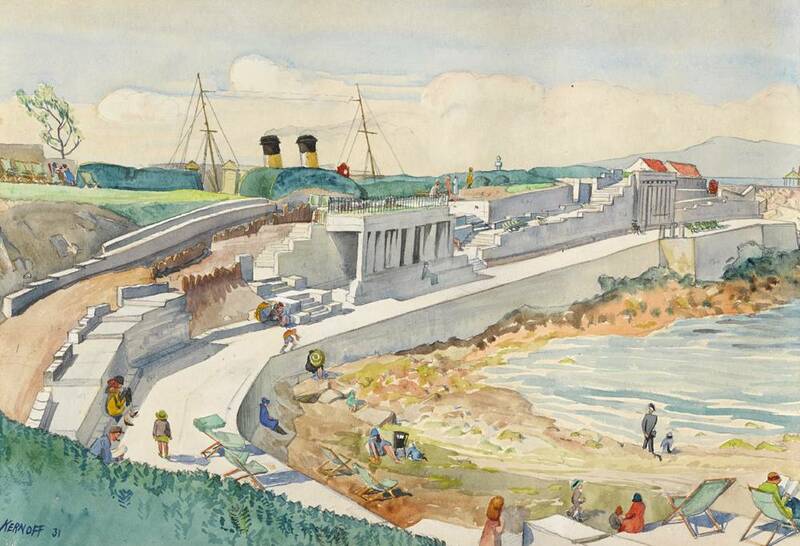 “Sun Terrace, Dun Laoghaire Pier” dated 1931, watercolour (10½ x 15¼in), sold at Whyte’s – 28/5/2018 for €10,500. Untitled mixed media on board (9″ x 12.5″), sold at Morgan O’Driscoll’s – 24/9/2018 for €950.00. 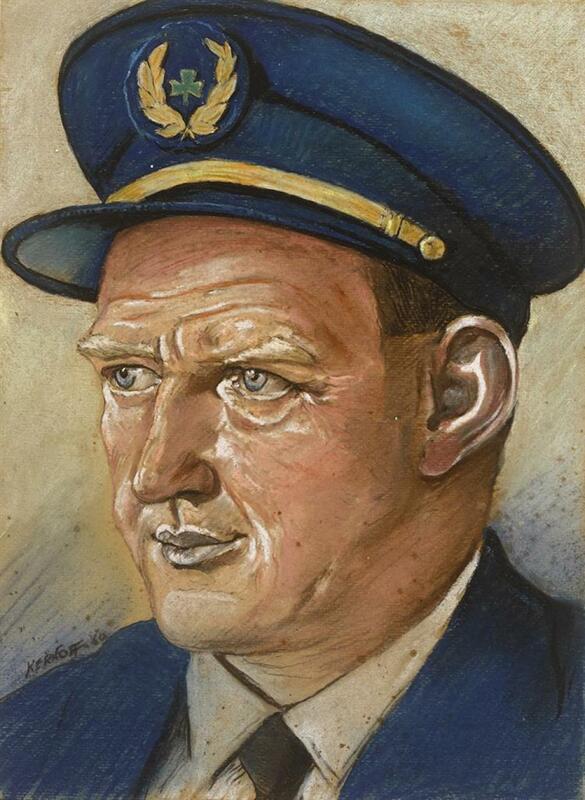 Left to right: “Irish Cailin” dated 1955, pastel (13.5″ x 10.5″), unsold at Morgan O’Driscoll’s – 3/12/2018; and “Portrait of Aer Lingus pilot Captain John Tweddle, 1960” pastel (13.5″ x 10″), sold at Whyte’s – 4/3/2019 for €750.00. 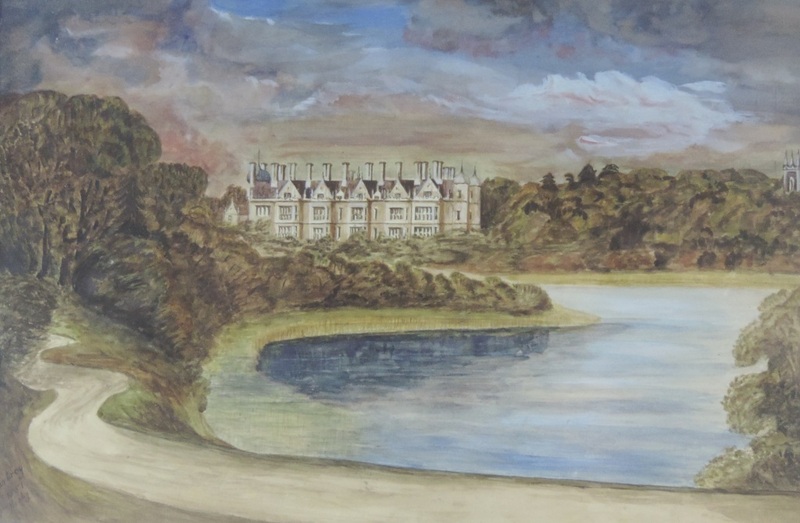 Helen Kerr trained in textiles at Belfast College of Art, Brighton College of Art and Goldsmiths College, London. 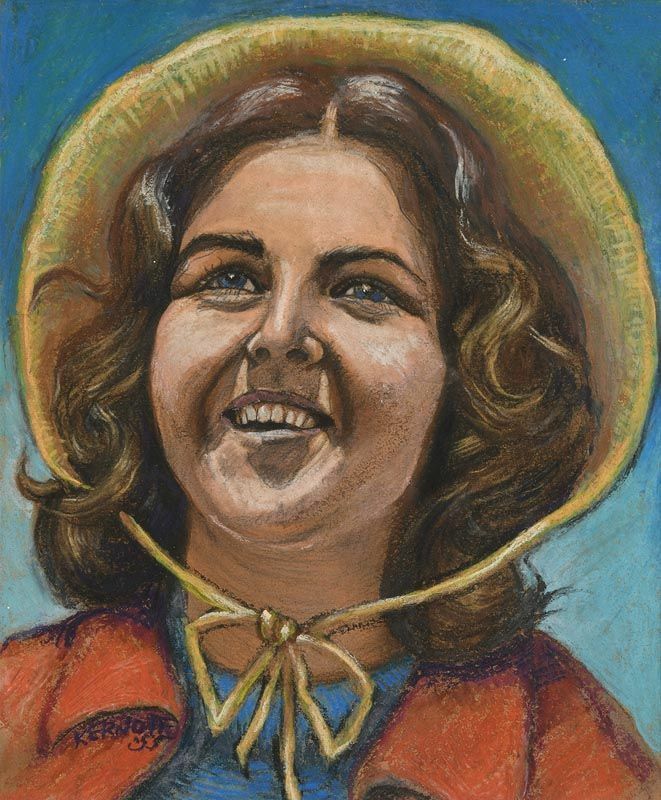 She taught at various schools in Belfast until leaving to work full-time in her studio in Dundrum, Co.Down in 1987. 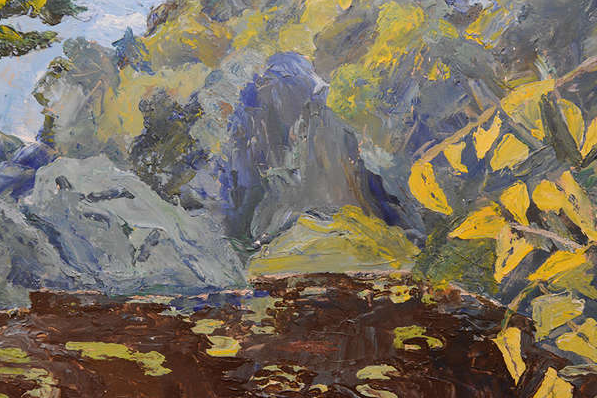 Contemporary artist living and working in County Wicklow. Born in South Africa in 1937. Moved to Canada in 1967. 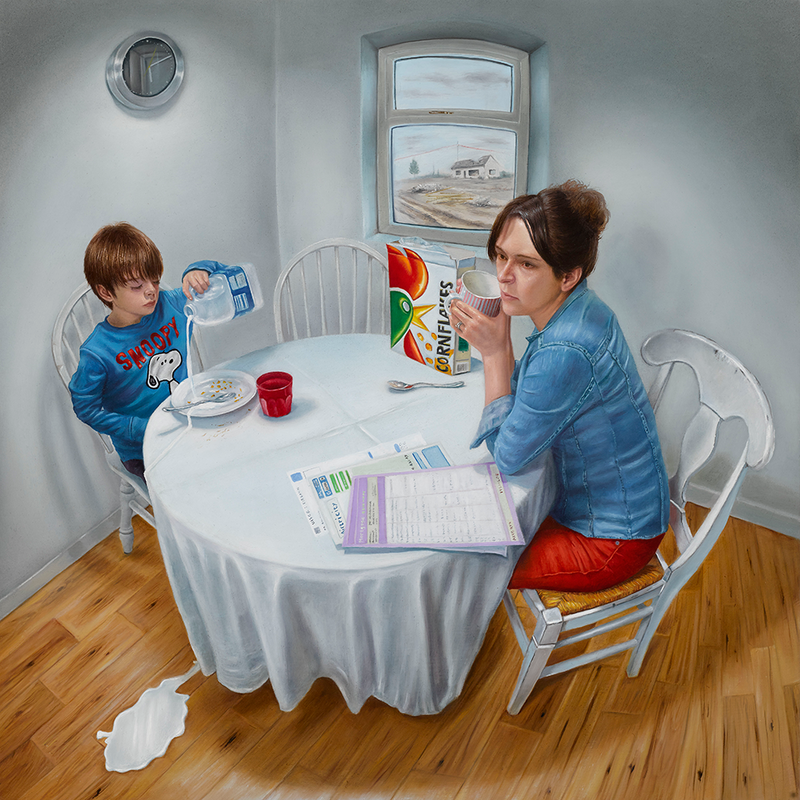 Became an illustrator, working for Advertising Agencies, Magazines and the Canadian Government. 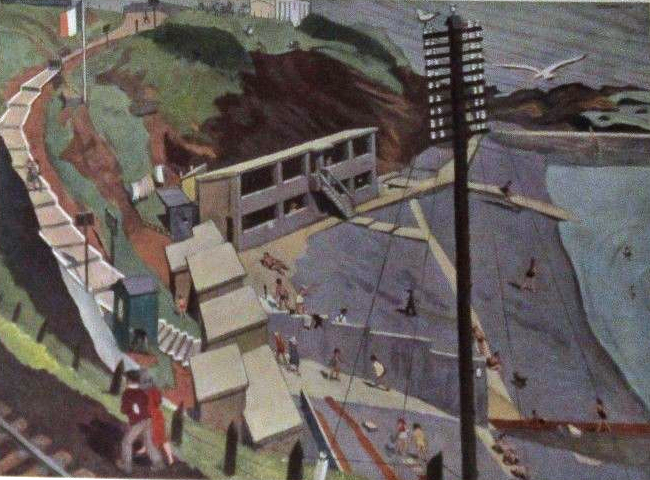 Began painting in 1974. Won awards for his portraiture. 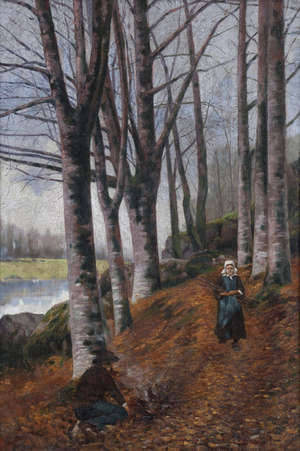 The human form is a great influence in his paintings. 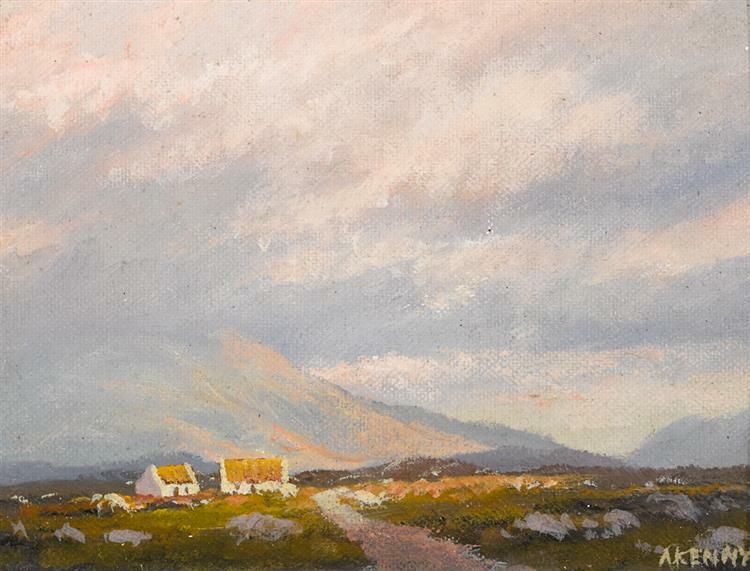 Has been living and painting in Ireland since 1988. 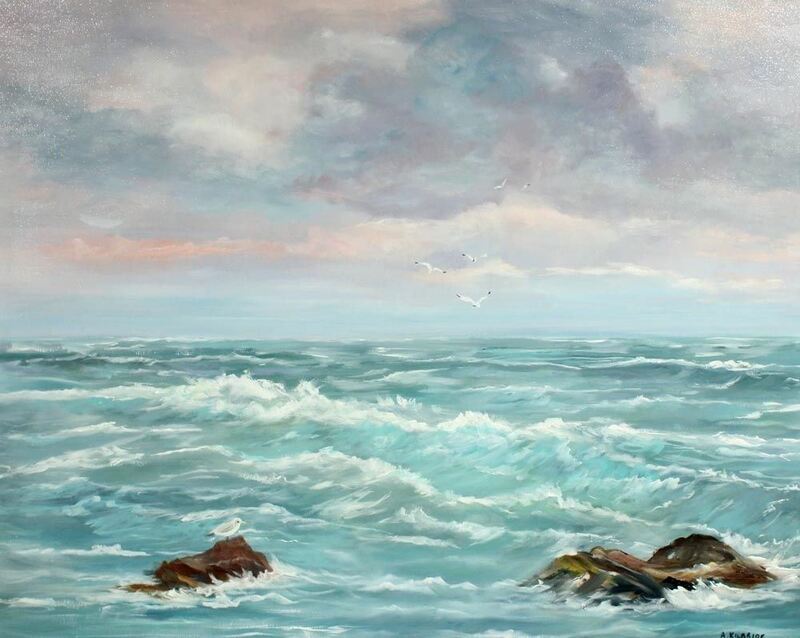 “Seascape” oil on canvas (23″ x 29″), sold at Gormley’s – for £200.00. 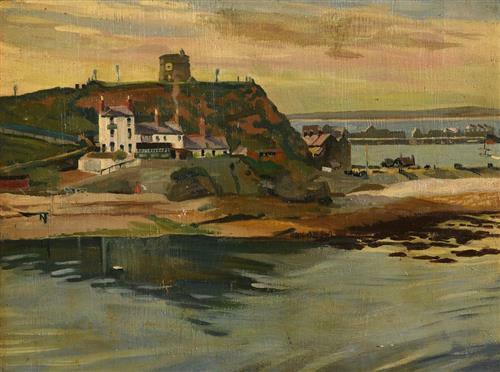 “Ardglass Harbour” oil on canvas (16″ x 30″), unsold at Ross’s – 13/2/2019. 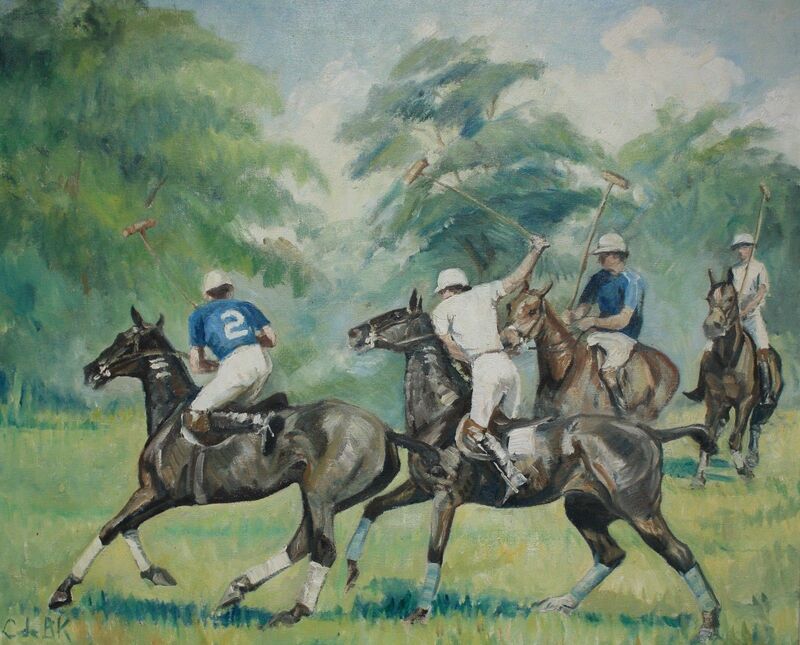 “Polo” oil on canvas (24″ x 30″). Left to right: “Mountain Range” watercolour drawing (12″ x 15″), sold at Ross’s – 9/8/2017 for £30.00; and “Wild Horses” watercolour drawing (12″ x 15″), sold at Ross’s – 9/8/2017 for £40.00. 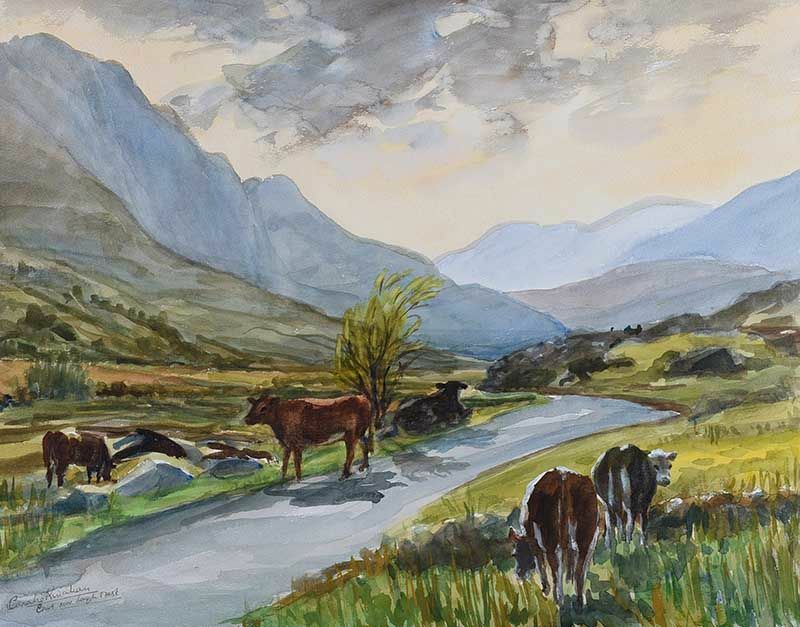 Left to right: “Stream & Woods” watercolour drawing (14″ x 10″), sold at Ross’s – 11/10/2017 for £70.00; and “Cows grazing near Lough Mask” watercolour drawing (16″ x 19″), sold at Ross’s – 21/3/2018 for £50.00. 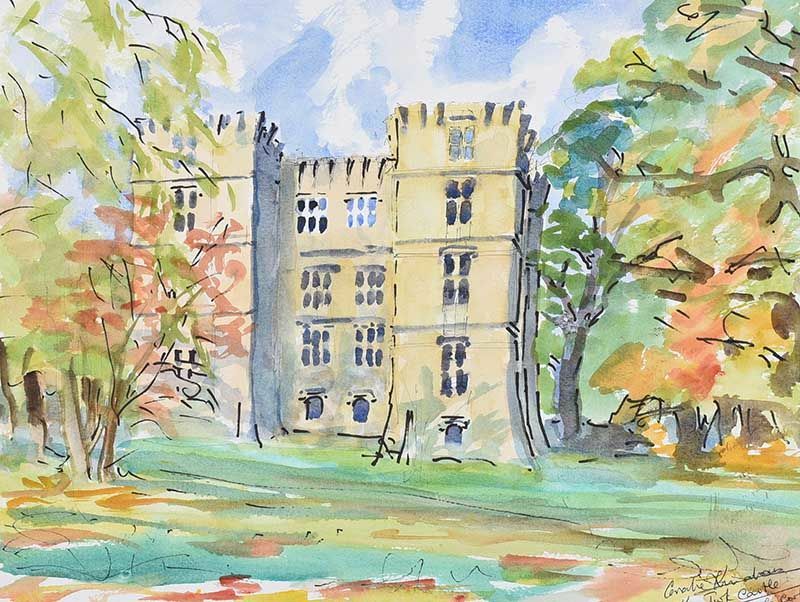 “Kanturk Castle, Cork” watercolour drawing (12″ x 15″), sold at Ross’s – 23/5/2018 for just £20.00! “Harbour Scene” oil on canvas (20.5″ x 24.5″), unsold at Milltown Country Auction Rooms – 11/9/2017. 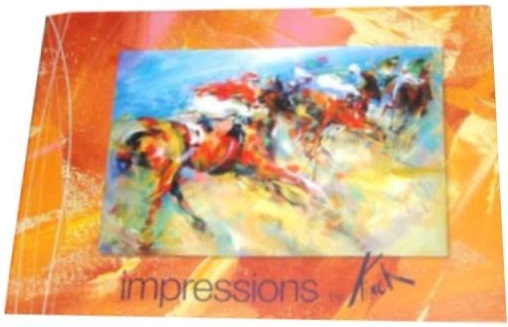 “Impressions” by Kinch (2013) – a limited edition book (just 200 copies) self published by the artist and containing 94 pages of full-colour plates plus details, notes and comments. David King was born in Dublin and studied at the National College of Art and Design graduating with an M.A in Fine Art in 1997. 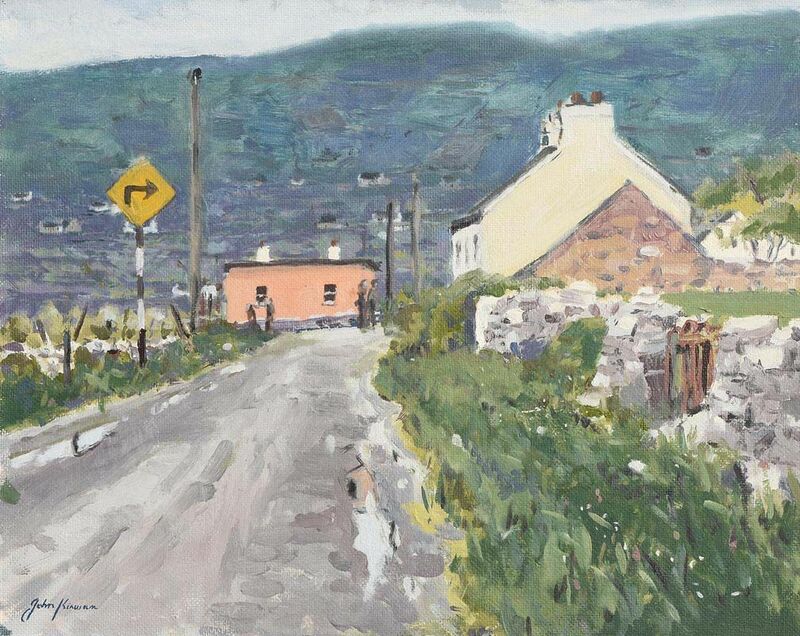 “Dunmore, Co.Laois” oil on linen (23″ x 44″), sold at Fonsie Mealy’s – 26/7/2017 for €1,300. 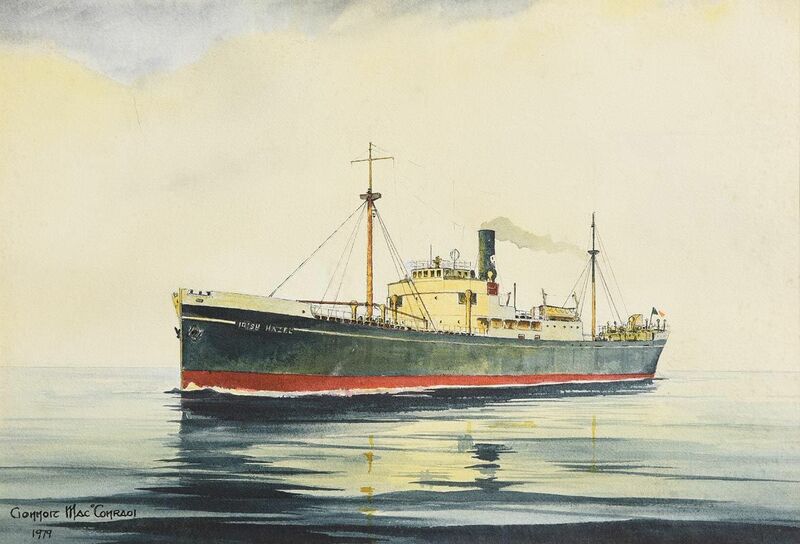 Born in Dublin, Kenneth King was commissioned into the Royal Navy as a Chaplain and served in the Arctic, Atlantic, Mediterranean and Far East waters. 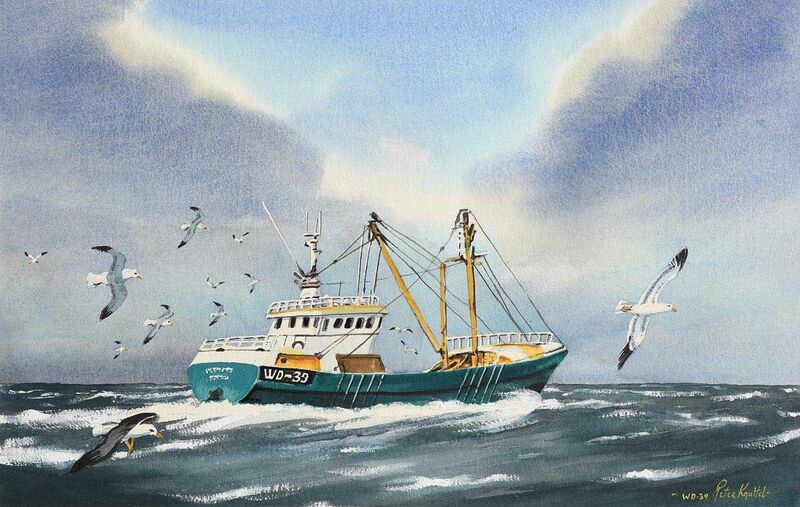 He began painting full-time in 1976, specialising in the naval and merchant shipping of Ireland, together with the country’ coastline and lighthouses. His work has been commissioned by State and Private sector shipping interests, by the R.N.L.I., An Post, B.I.M., and the Office of Public Works. 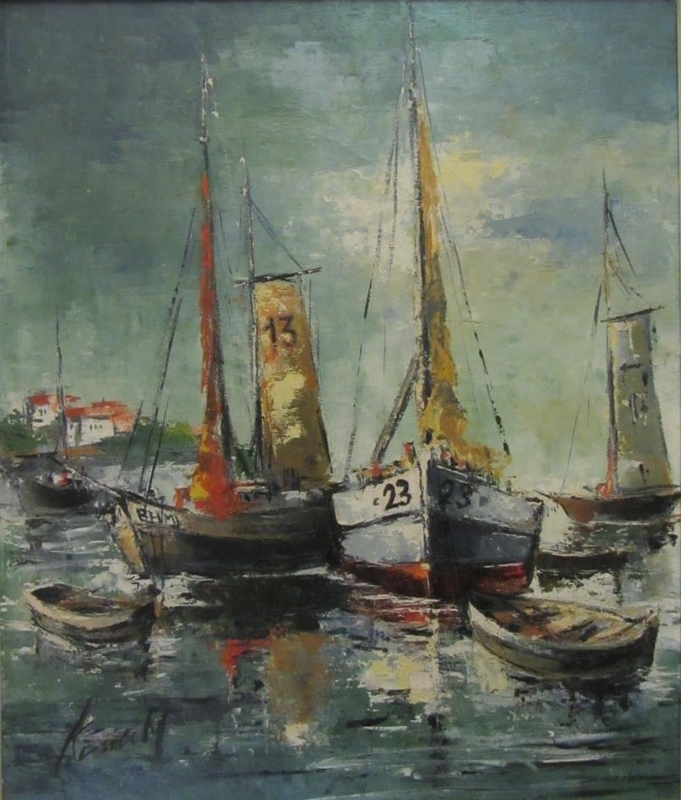 His works are also to be found in the collections of the Irish Navy, the Marine Institute, Shannon Estuary Ports, Killybegs Fishermens’ Organisation and the Maritime Institute of Ireland as well as in numerous private collections both at home and abroad. 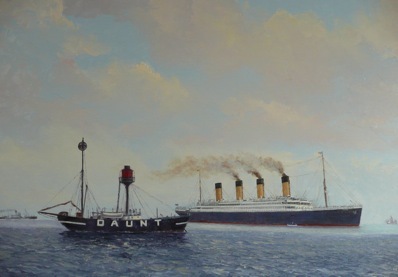 11th April, 1912 and the RMS “Titanic” passes the Daunt lightship south of Cork Harbour on its ill-fated maiden voyage. 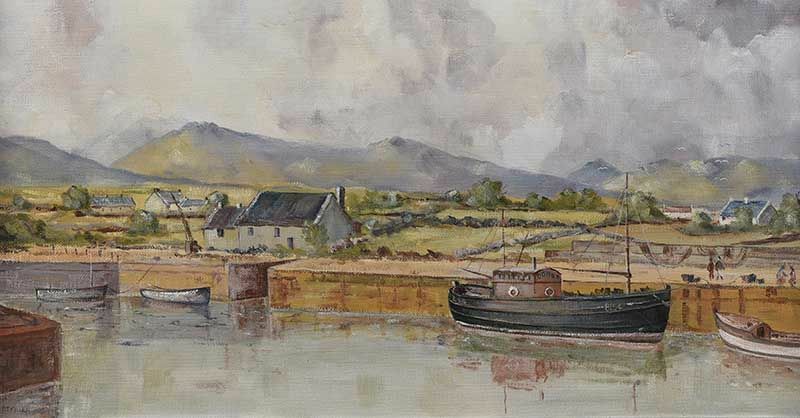 Left to right: “SS Irish Hazel” watercolour (10″ x 15″) sold at Morgan O’Driscoll’s – 8/8/2016 for €90.00; and “Glencolumbkille & Glenloch, Donegal” oil on board (16″ x 22″), sold at Ross’s – 21/2/2018 for £300.00. 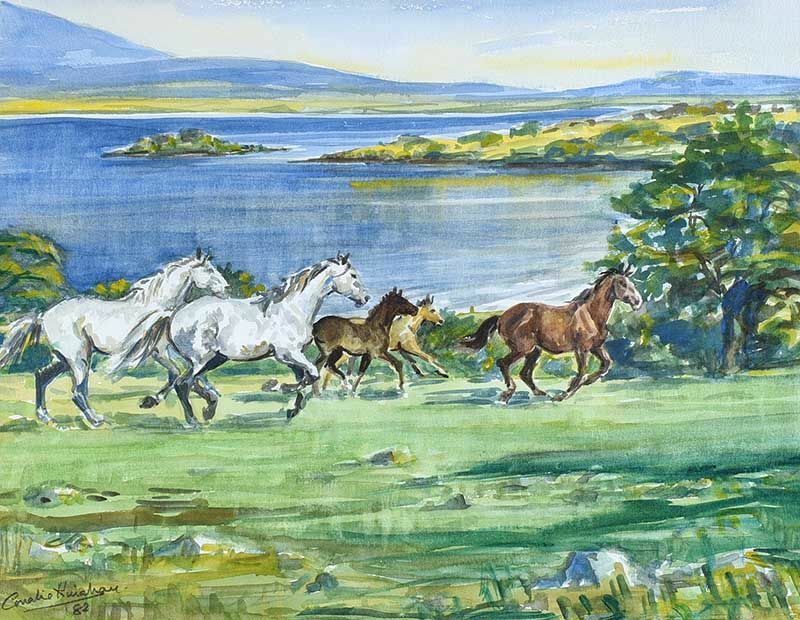 Richard Joseph King was an Irish stained glass artist and illustrator from County Mayo. 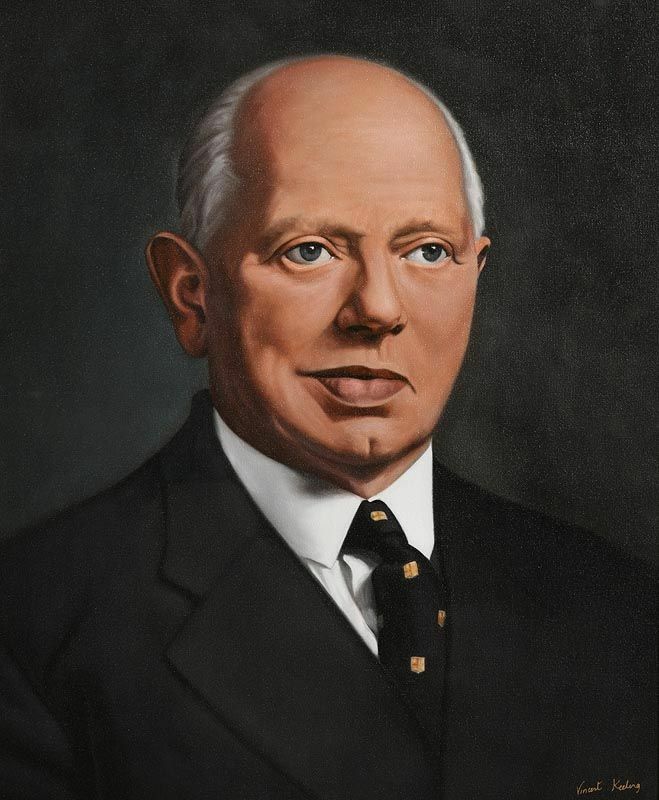 He also designed 12 stamps for the Irish government, beginning in 1933 for ‘The Holy Year’, and a stamp to commemorate the golden jubilee of the GAA in 1924, Constitution and St. Patrick in 1937, Four Masters in 1944, Thomas Davis in 1945, Davitt and Parnell stamps in 1946, four airmail issues in 1948/49 and James Clarence Mangan in 1949. Above: two of his iconic airmail stamps from 1948/49. 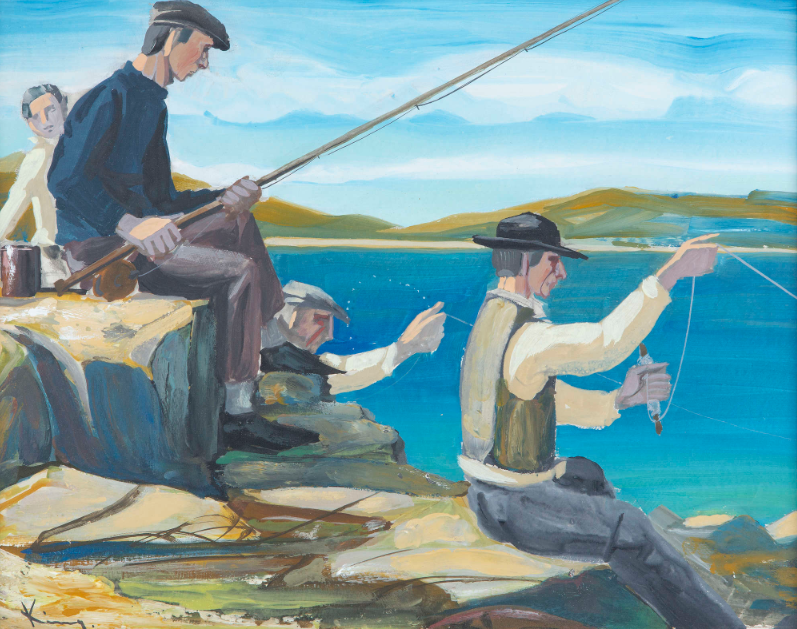 “Rock Fishing, Gurteen” gouache on board (15″ x 19″), sold at Adam’s – 27/3/2019 for €1,400. 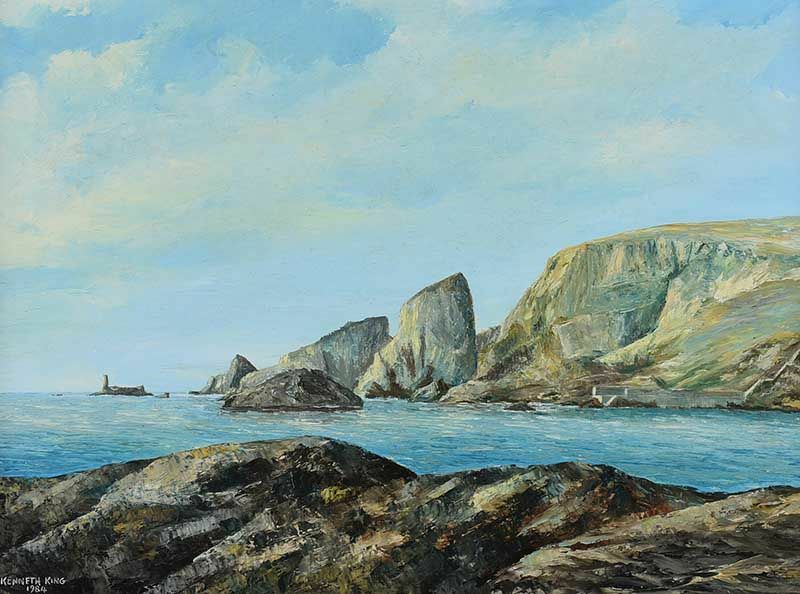 “Incoming Tide Errislannin” oil on canvas (14″ x 18″), sold at Dolan’s – 8/2018 for €500.00. 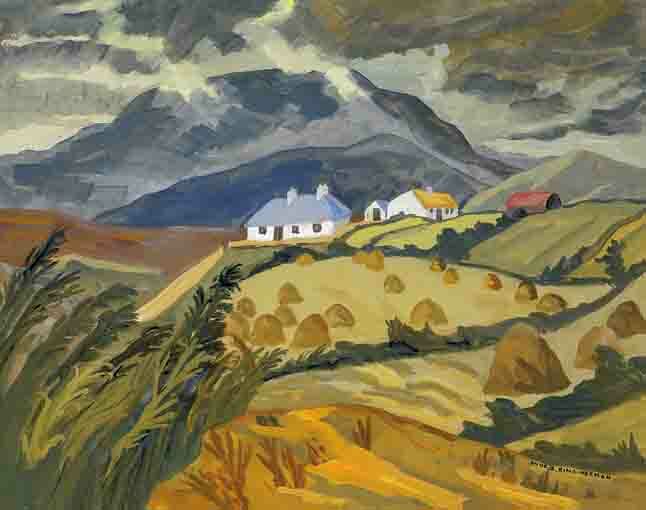 “Cottages and Hay-stacks with Rain-clouds approaching” gouache on board (16″ x 20″), sold at Whyte’s – 18/11/2003 for €1,100. Left to right: “Lough Key” oil on board (16″ x 20″), sold at Adams – 22/4/2015 for €200.00; and “Ben Goram, Co.Mayo” oil on canvas (12″ x 15.5″). 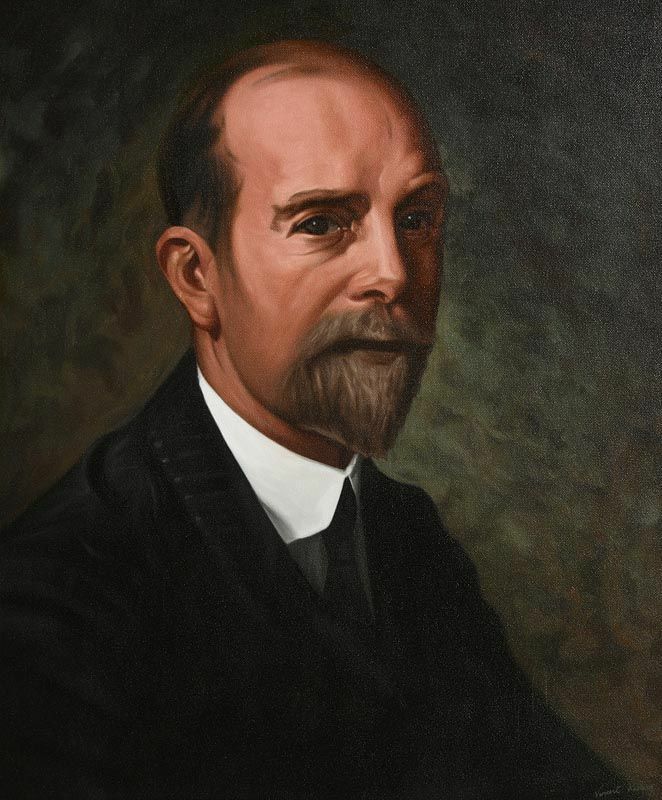 Born in Portstewart, Co.Derry and educated at Methodist College, Belfast. 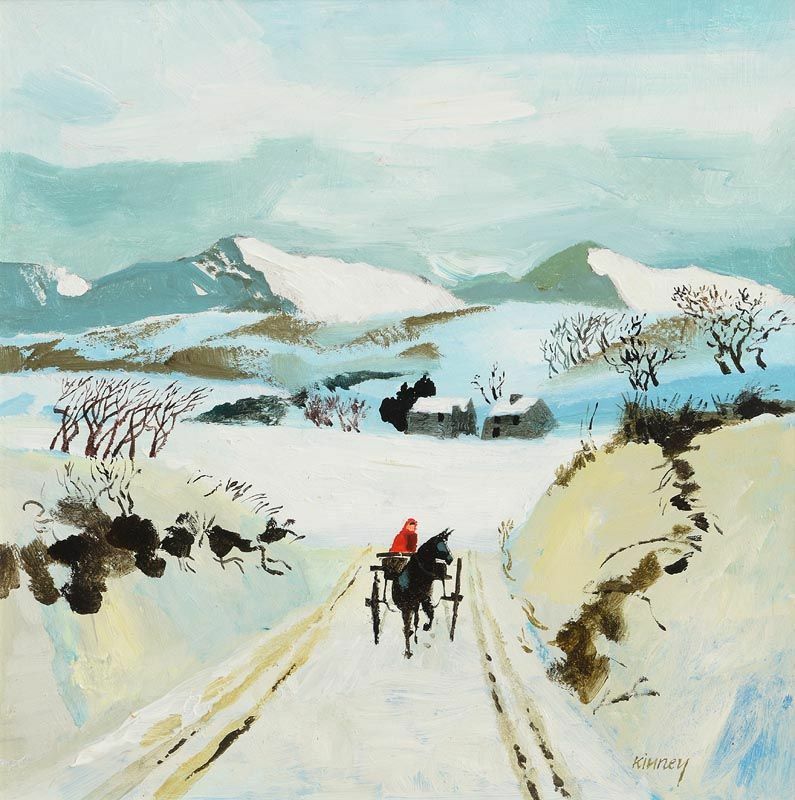 “Fresh Snow” oil on board (12″ x 12″) sold at Morgan O’Driscoll’s – 2/8/2016 for €700.00. “Planting Out” oil on board (14″ x 14″) sold at Morgan O’Driscoll’s – 8/8/2017 for €800.00. 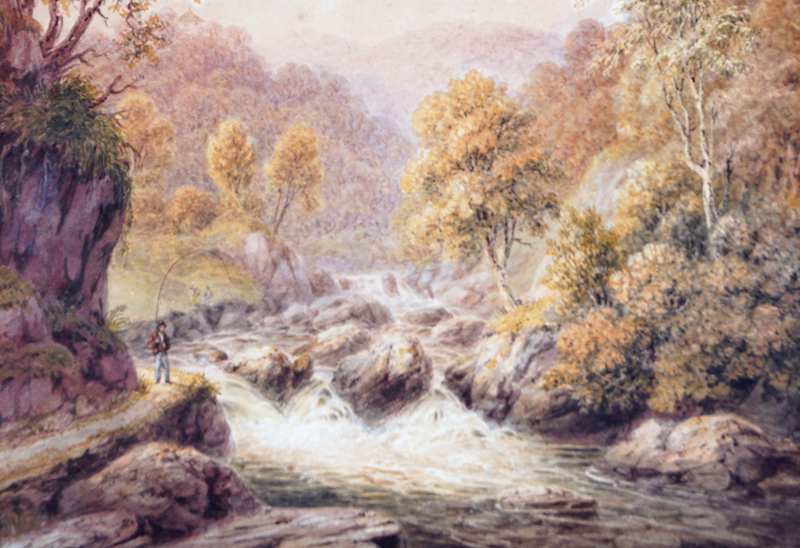 “Dartrey (formerly Dawson Grove) Rockcorry, Co. Monaghan” dated 1851, watercolour (11″ x 17″), sold at Fonsie Mealy’s – 8/3/2017 for €250.00. 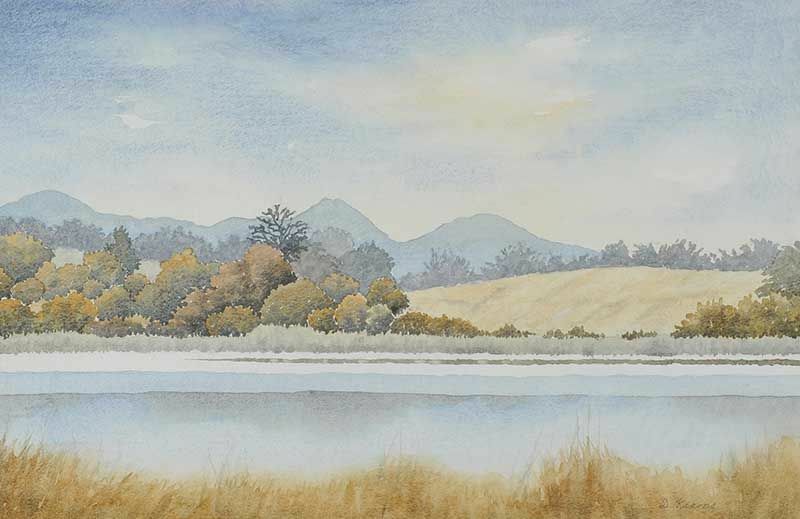 “A View in the Dargle, Co.Wicklow” watercolour (9″ x 13.5″), sold at Sheppard’s – 25/9/2018 for €1,300. 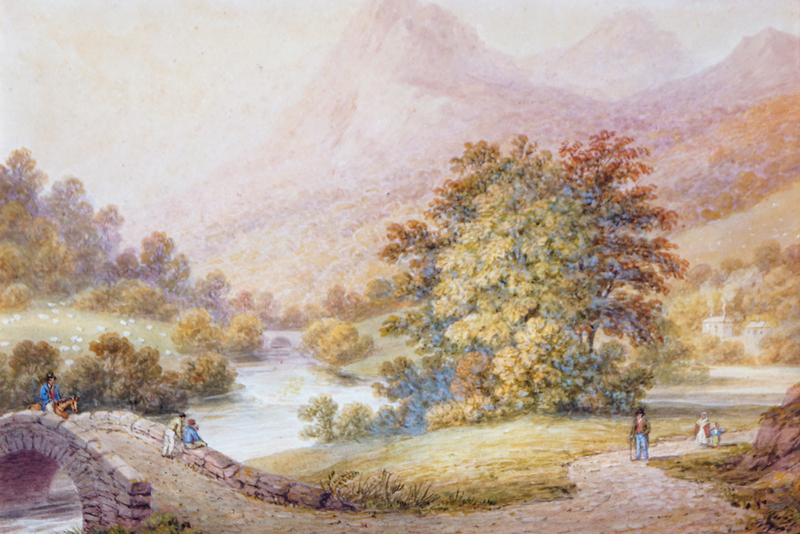 “The Meeting of the Waters, Co.Wicklow” watercolour (9.5″ x 14″). 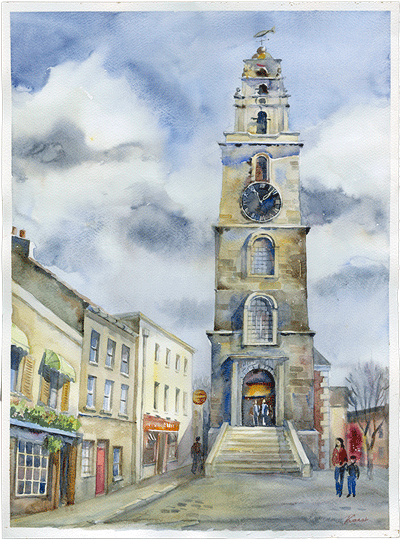 John was born in Dublin and graduated from Dun Laoghaire College of Art in 1978. 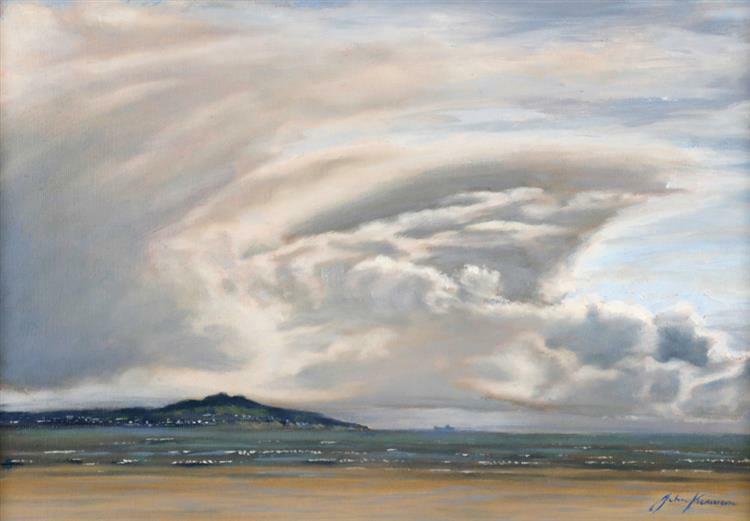 “Dublin Bay Triptych” oil on canvass (22″ x 48″) sold at Whyte’s 29/9/2008 – €2,000.00. 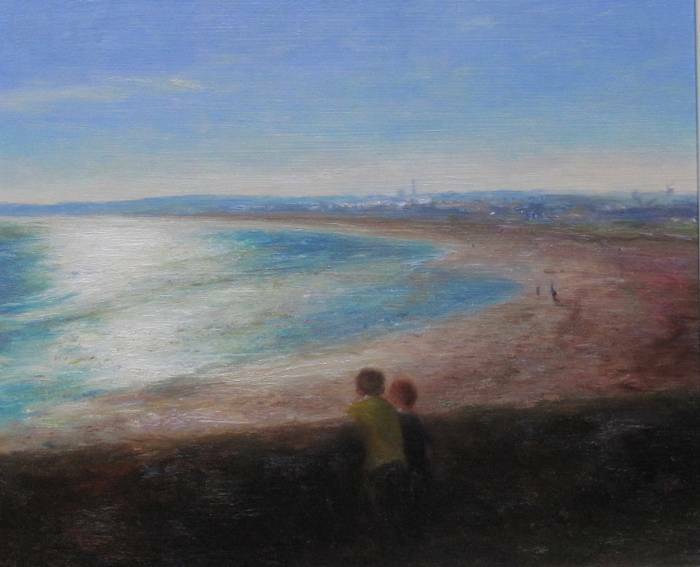 Left to right: “Road to Achill” oil on board (16″ x 20″), sold at Morgan O’Driscoll’s – 6/3/2017 for €700.00: and “Howth from Dollymount, Dublin” oil on canvas (10″ x 14″), sold at Whyte’s – 17/7/2017 for €480.00. 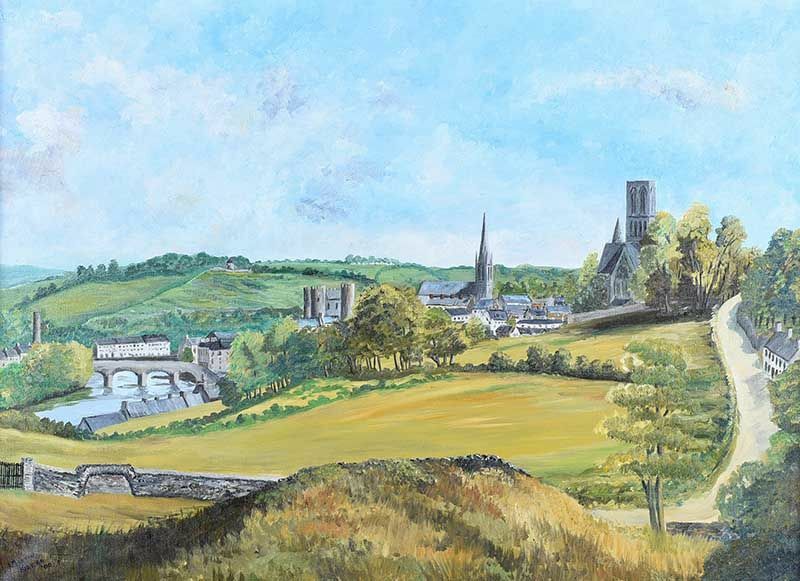 “Enniscorthy, County Wexford” oil on canvas (30″ x 40″), sold at Ross’s – 5/12/2018 for £50. 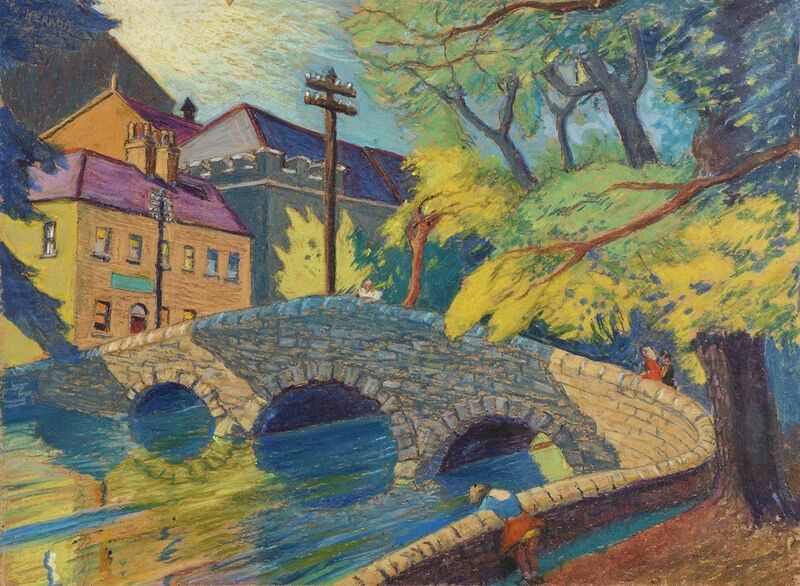 Born in London, he arrived in Dublin in 1912 where he worked and painted for the rest of his life. 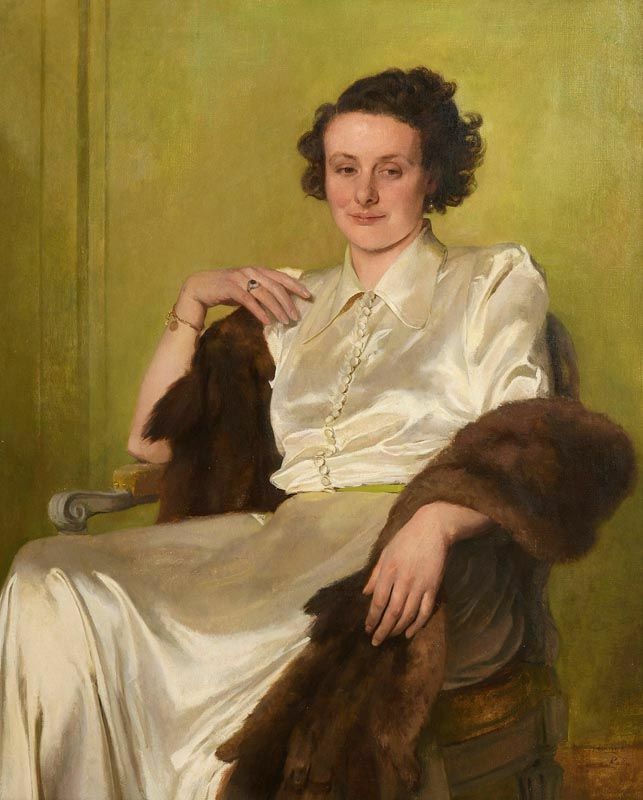 Apart from an occasional class at the Dublin Metropolitan School of Art, Knee was almost entirely self-taught. 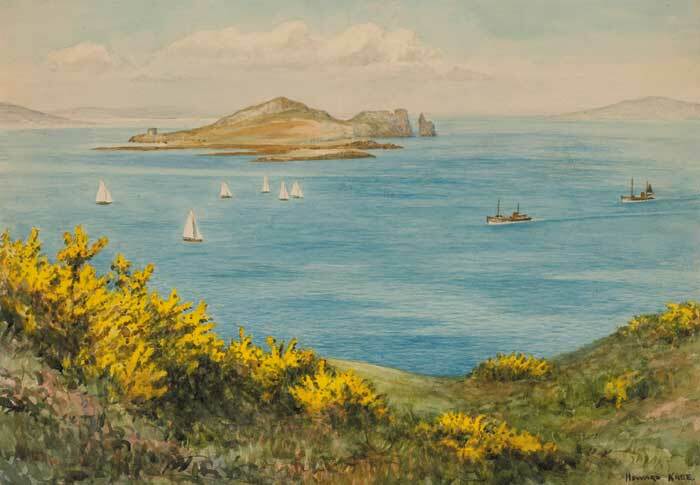 “Ireland’s Eye from Howth, Co.Dublin” watercolour drawing ( 10.5″ x 14.5″), sold at Whyte’s – 26/5/2007 for €300.00. 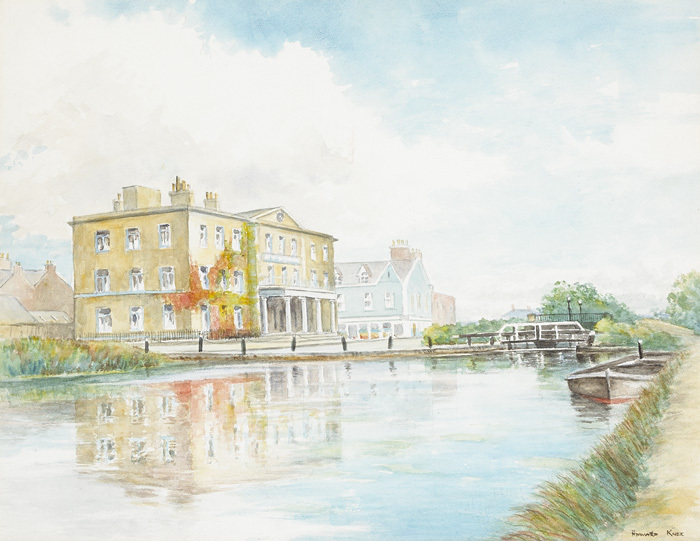 “View of Portobello House” watercolour (14.5″ x 19″), sold at Whyte’s – 11/3/2015 for €320.00. 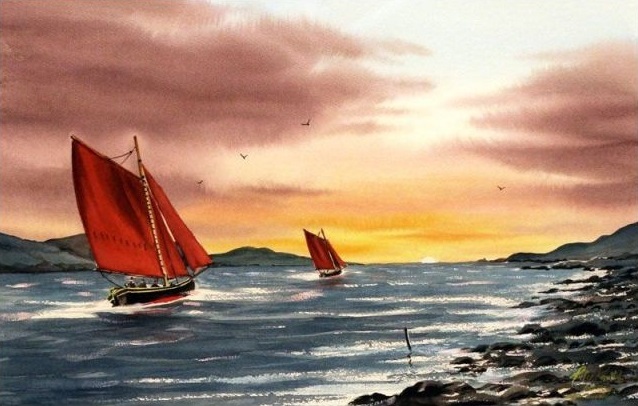 “Galway Hookers” sold at Gormley’s 8/5/2012. 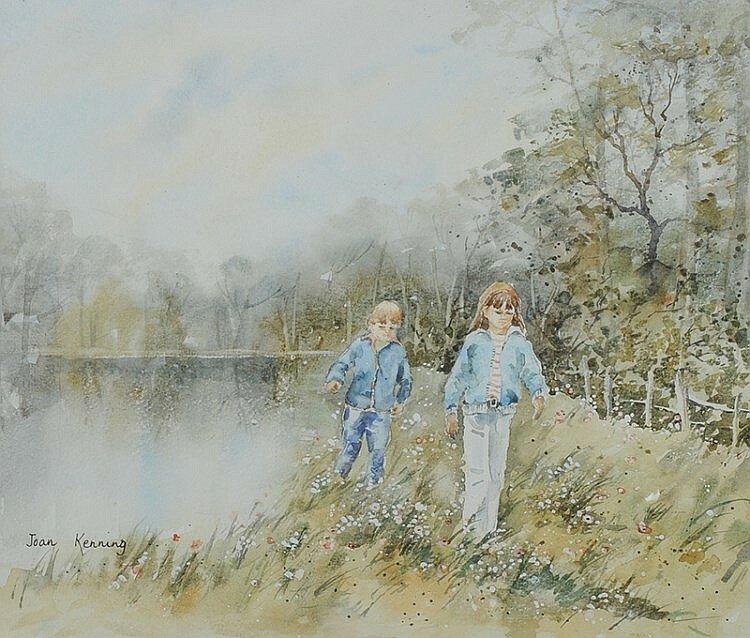 “WD.39” watercolour (14″ x 21″), sold at Morgan O’Driscoll’s – 3/10/2016 for €200.00. 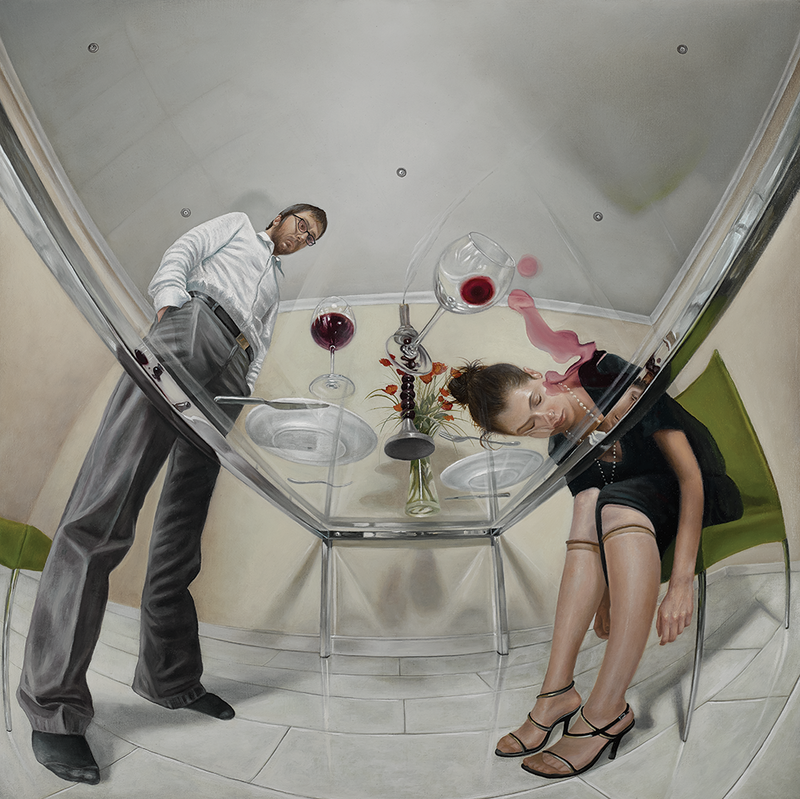 Ludmila was born in the Ukraine and graduated from Kiev State Academy of Fine Art in 1989. 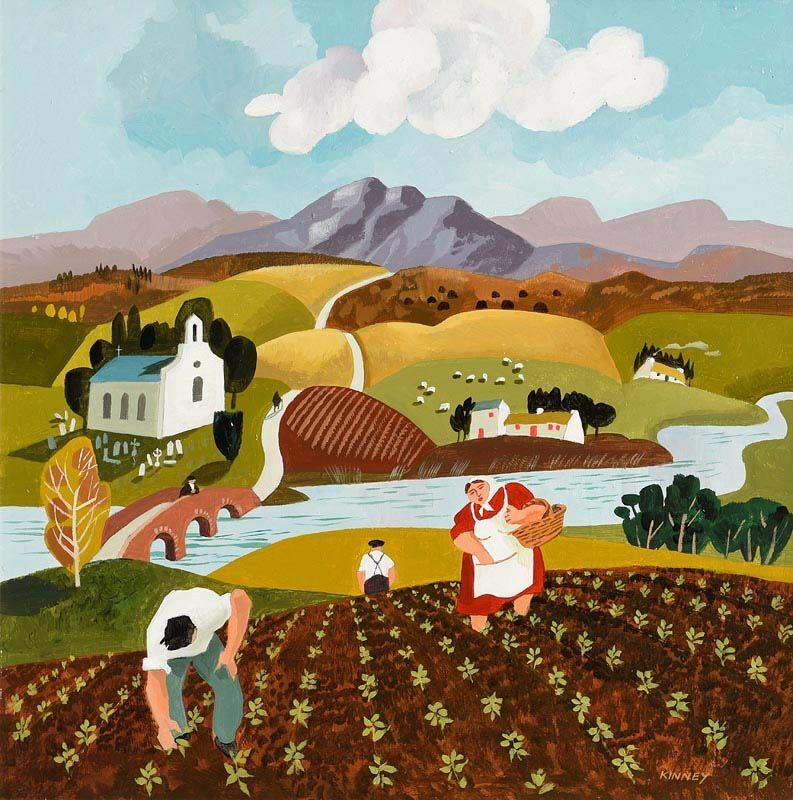 From 1992 she lived and worked as an artist in Prague. In 1996 she moved to Ireland. 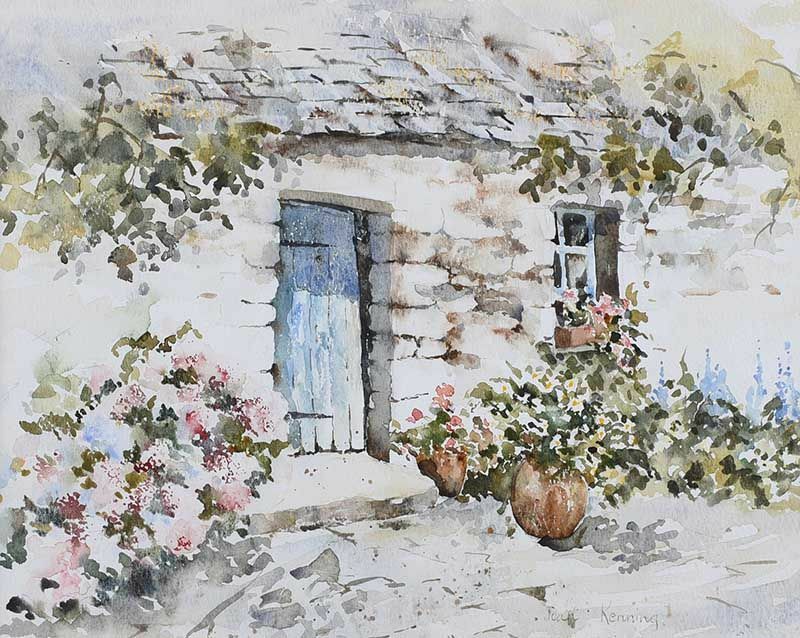 She works in various genres including abstract and watercolour. 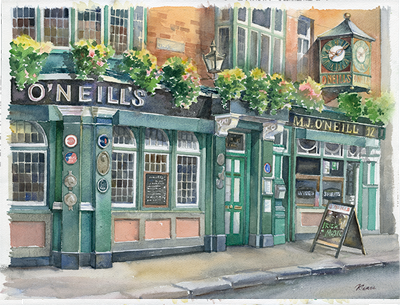 Left: “Under the Goldie Fish, Cork” and Right: “O’Neill’s, Dublin” both watercolour on paper.